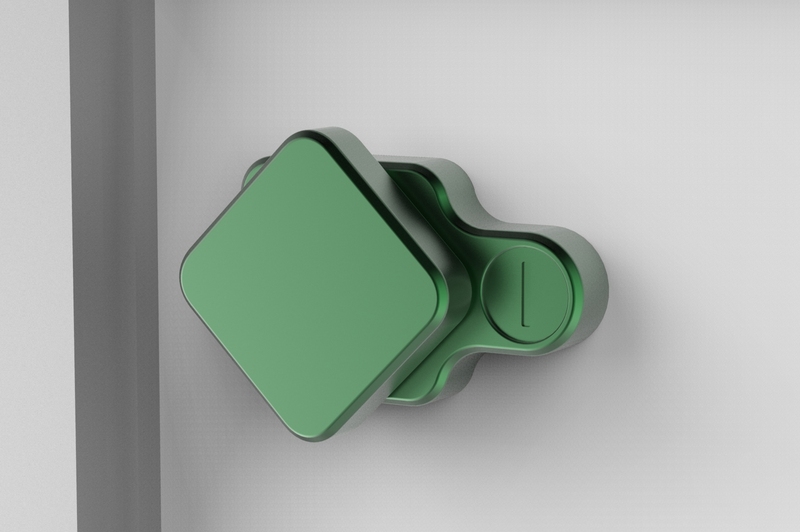 The first connected mailbox lock that will turn your traditional mailbox into a safe and shared deposit box! Aimo will allow you to open your mailbox using your smartphone, thanks to a virtual key. No need for a physical key anymore! And the plus? You will be able to share those keys with your friends, family and neighbors without needing their presence! Open your mailbox with one push, with your phone in your pocket, thanks to bluetooth. The lock is made of steel and designed to be unbreakable with common tools. Send personalized email invitations to access your mailbox through the mobile application. Aimo works with a mobile application that the user can download for free. 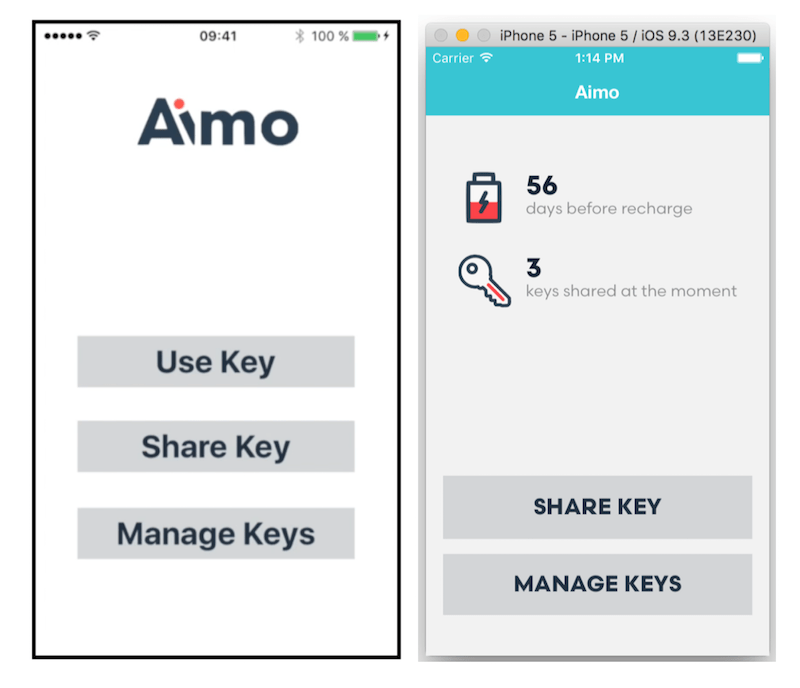 Through the Aimo application, you will be able to manage and share your virtual keys, on which you can set an expiration date. And don’t worry, you won’t need to open the application every time you want to open your mailbox. Just keep your smartphone in your pocket! 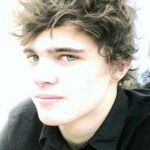 I graduated from EPFL with a Bachelor’s degree in Computer Sciences. 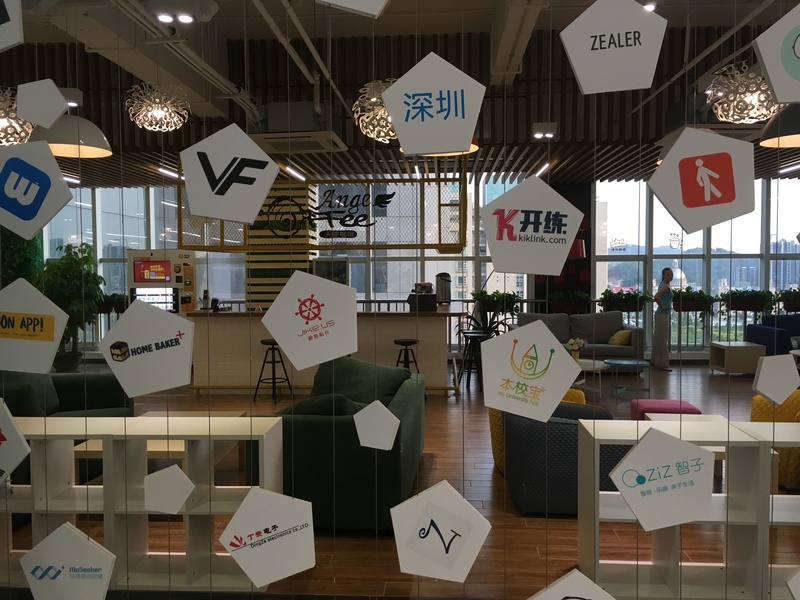 In parallel of my studies, I had the chance to work for several startups. I love the spirit emerging from those places filled of creativity and skills. To me, CHIC is a great opportunity to work on a practical project in team where each member brings his own field of expertise. I must admit that I am really eager to see where this adventure will lead us! 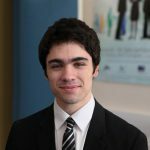 I have a bachelor degree in Electronics Engineering from Polytechnica University of Bucharest, Romania and I am currently doing a masters in robotics and space technology. 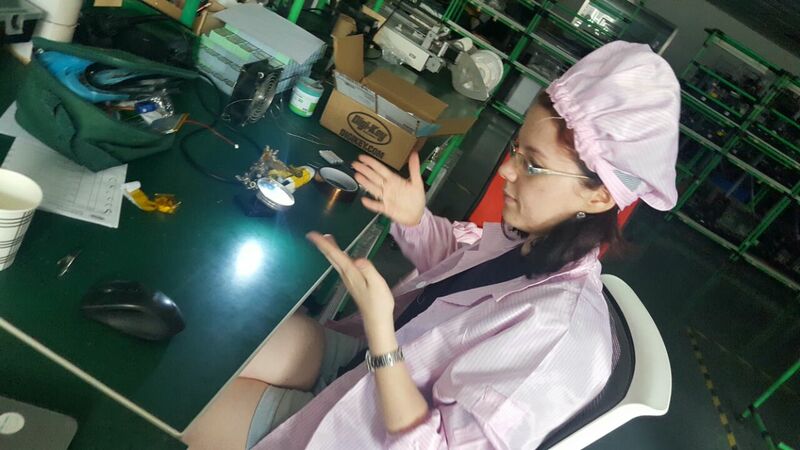 I am extremely happy to help my team to built a reliable product for CHIC with my expertise in electronics engineering. 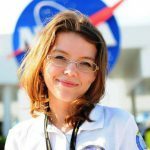 During my university years, I had worked on several projects with European Space Agency and NASA, and I did an internship at CERN. Back in Romania, I was invited to several TEDx talks. As hobbies, I love to take pictures of planes and to read books regarding personal and team development. 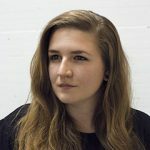 I am a student in Media & Interaction Design at ECAL, Lausanne. Since childhood I always have the habit of analyzing our everyday objects. After a multimedia designer apprenticeship, it was natural for me to continue my journey to develop and combine my competences in the fields of art, graphic design and multimedia. Today, my research are mainly directed to the contribution of technological and artistic methods in our daily life. I completed my Bachelor of Management at HEC Lausanne and am currently doing my Master in Information Systems at HEC Lausanne. I like new challenges and working together with people having different backgrounds. 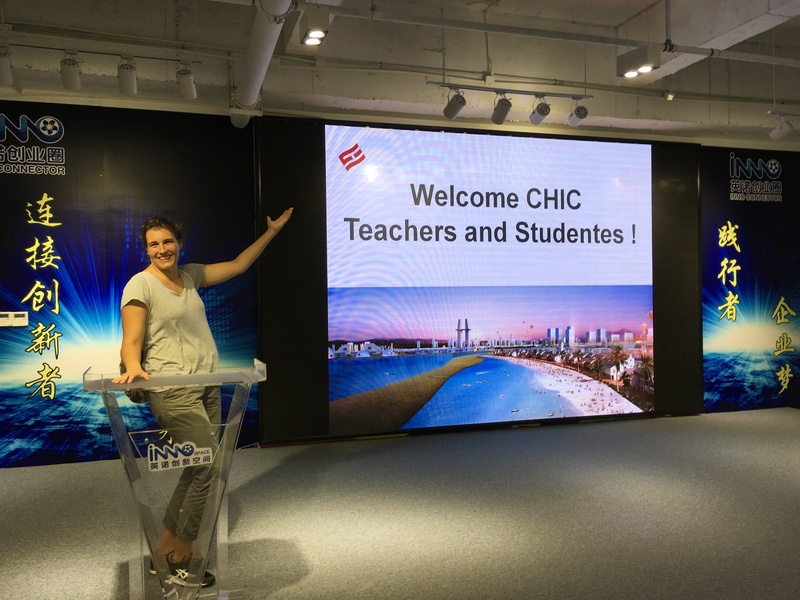 The CHIC experience will allow us to create something new and great as well as taking advantage of the different competences and skills brought by the different members of the team. 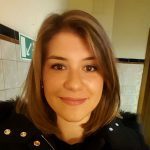 In the past I have worked at Credit Suisse in a team of regional IT project managers and have learned a lot there about collaboration between people working in different fields. I my free time I love to listen to and play music. I am design student and I have been passionate about the shapes of every objects around me since I was a child. I also love nature, good food and sliding sports such as snowboard and surf. I'm very curious and open minded. I think that Chic will be a great opportunity for me to work in a team with so many different skills. I am passionate about robotics and innovation since my childhood. Freelance and self-learning, I'm curious and I always give priority to action over reflection. This allowed me to take part of several big projects and work for one of the most advanced startup in robotics. 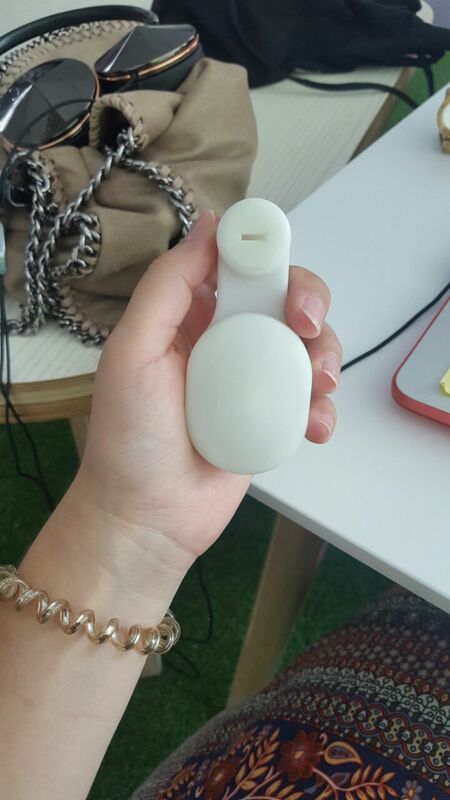 I think CHIC is the best opportunity for me to take advantage of my past experiences and already acquired knowledge of connected devices and entrepreneurship on a unique project to carry out from design and prototyping to manufacturing, and all this within a stimulating team involving six people with different training and background. 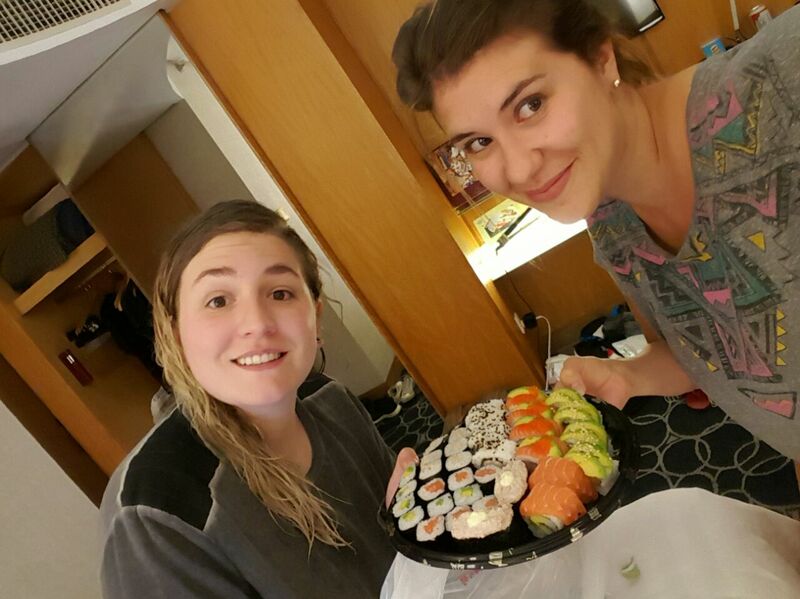 This trip has now come to an end, and let’s look at what we have done during the last days! As I mentionned before, the television, the CCTV, was with us this day! 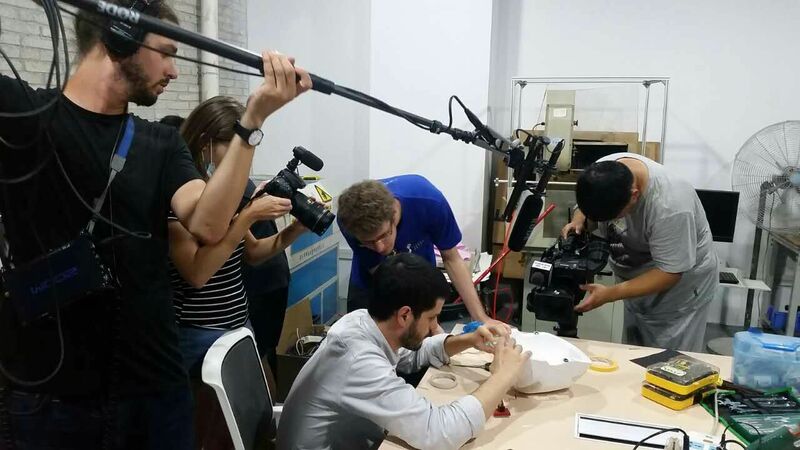 They captured us working on our prototypes and interviews a few people! They interviewed the professors to have a sense of their feeling during this adventure, they interviewed students about how they have lived this experience and also, at the end of the day, each team was captured while making a brief presentation of our respective devices, showing what was finally working! 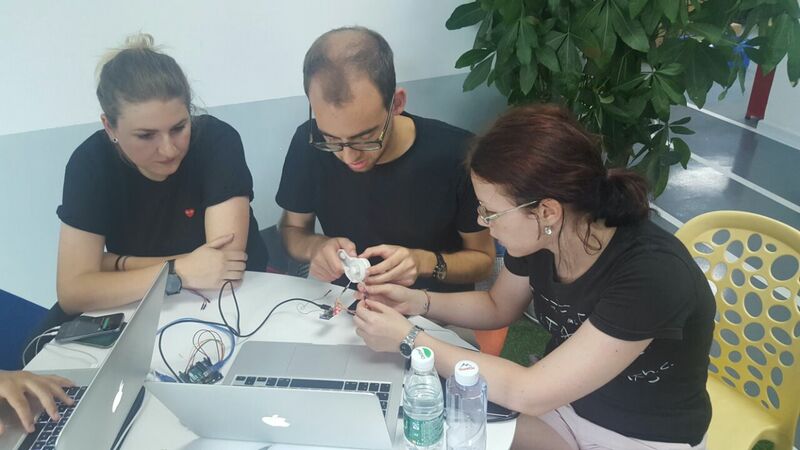 And at the end of the day, all the teams managed to have a functioning prototype (YAY!). Well, of course not all of us had all of our functionalities working properly and the devices that we had probably won’t look like the final product (because of the materials for example), but, we had something functioning, something to show! And I have to tell you that when you see that your team and you have managed to get to this in the end, you (almost) forget all the sweat and the late nights of work! What an achievement and great feeling! I am sure that all the teams are going to keep working on their products until we get to a first “real” device! And our next (and final) steps are the presentation in September at EPFL and ECAL and I look forward to seeing what all of the products are going to look like then! So don’t worry, you’ll get more pictures about the final products (I hope!). 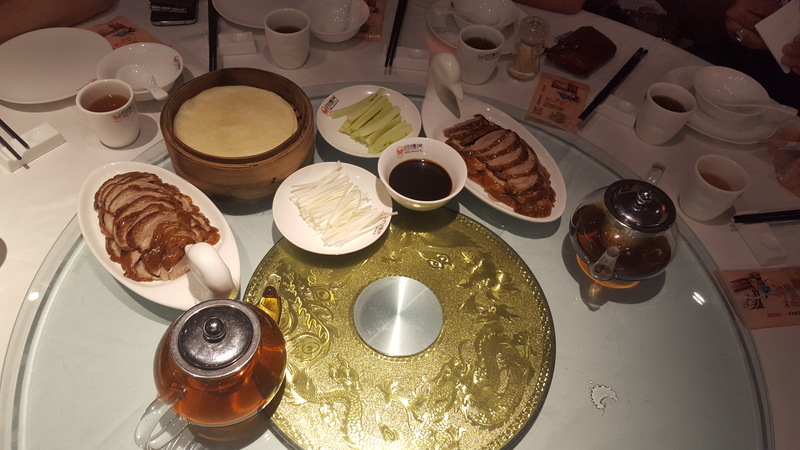 In the evening, after a very busy day, we went all together to the restaurant to eat some Beijing duck (after Yumeng showed us how it worked!) and it was really good!!! We had the last speeches (I almost shed a tear) and then we went out for our last beers all together! To conclude, I must say that this trip and this whole experience was amazing! We all learned a lot about our own field of studies, about other fields (for me, it was electronical engineering! ), about project management, about China, and so many other things. And most of all, I think that I’m safe when I say that we all had a lot of fun and we met great people during this adventure! Last day of hard work in China! This trip comes to its end! 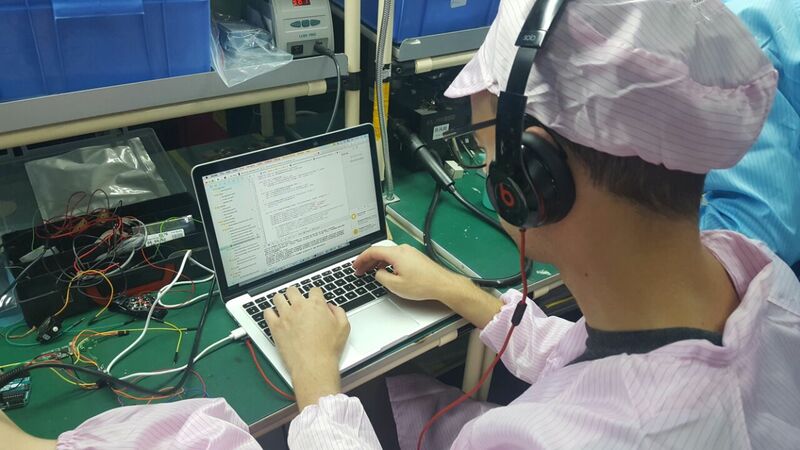 But even the day before leaving China, there is always time to work! 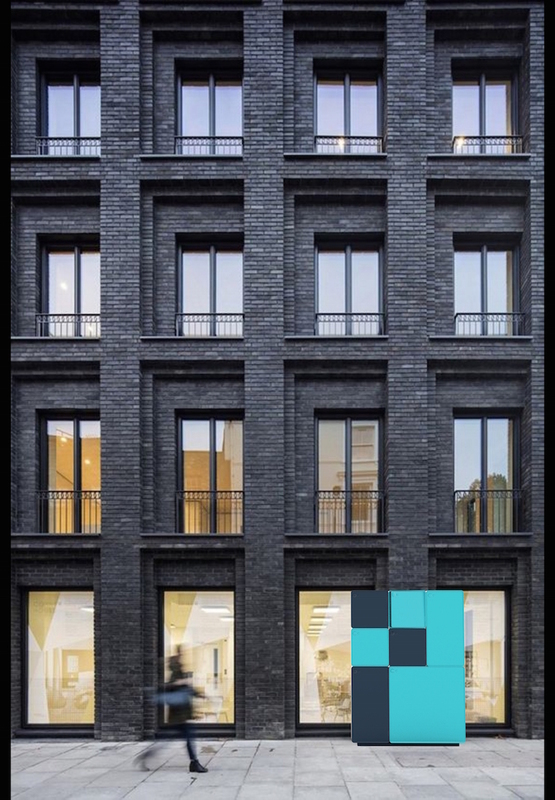 So today, the whole team together, we went to the new new offices of Seeed Studio (you read right, there are 2 new, because in fact we have discovered another of Seeed’s new offices). This was the final sprint! We all have worked together in order to (try to) have something functioning by the end of the day! I, personally, have been writing articles and helping around when I could. 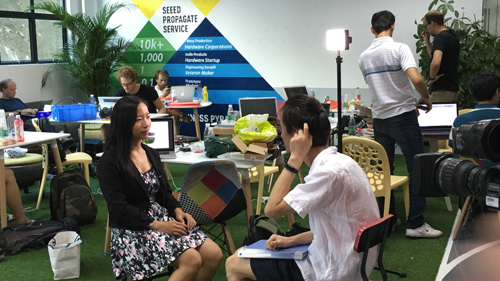 I also have had an interview with a journalist from CCTV, in which I talked about the CHIC experience from a business student perspective. Lara put our website online and has had an interview for the television! 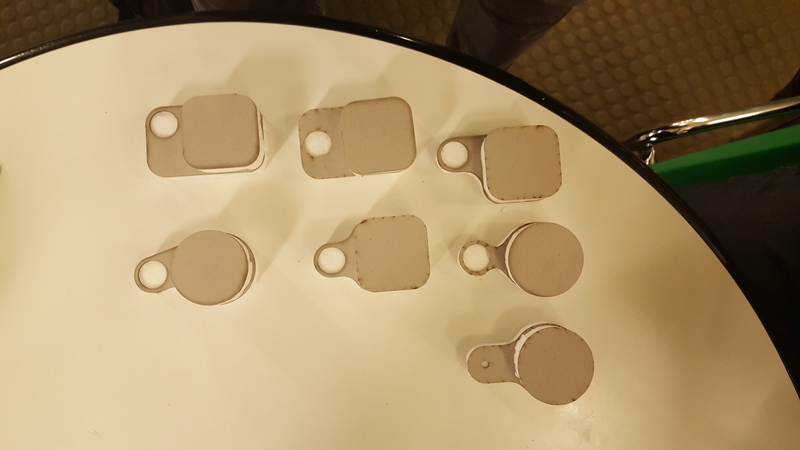 Alexis and JB filed and sanded our 3D prototype in order to be able to fit all the pieces together (we will need a few adjustments for the steel 3D printing). 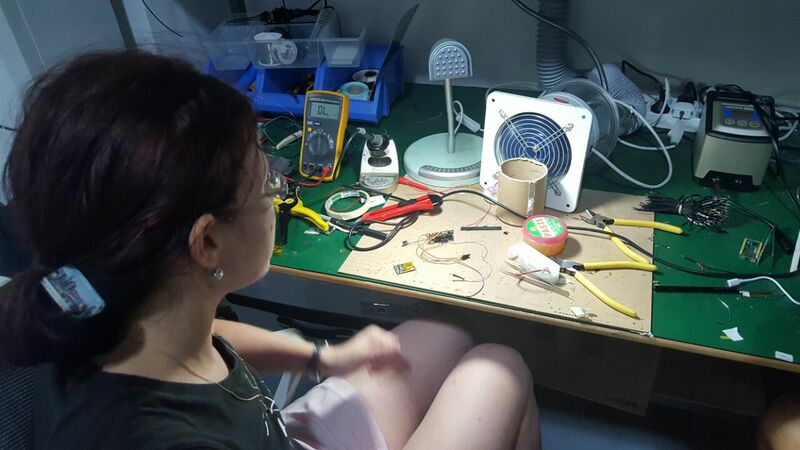 Sorina has been working on making the electronics parts work and Link on the software. This is the end of the trip, but of course not of the Aimo adventure! 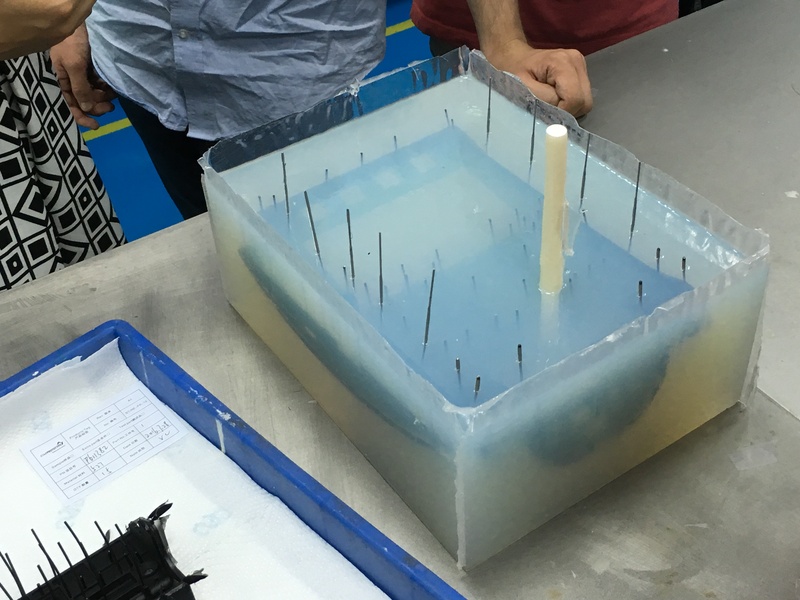 I’ll keep you informed of our advances and I’m sure we’ll have a completely functioning prototype to show you very soon! Also, don’t forget to visit our Tumblr and our website for more pictures and information about Aimo! Hello everyone! First of all, sorry for not posting in the last few days (I know you missed us), but we have been very busy! So, since last Thursday what happened? 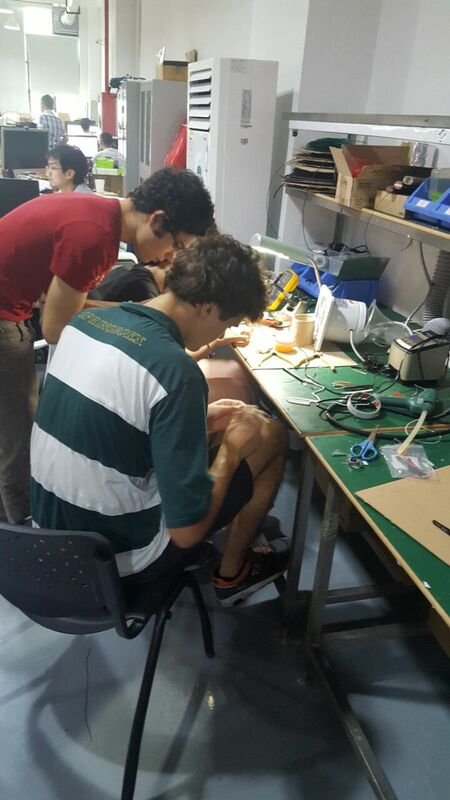 On Friday it was supposed to be our last day to work on the prototype, but fortunately we have been able to work a little bit more on it! Link, Lara, Sorina and myself (Sara) went to Seeed last Friday where we worked on several things. 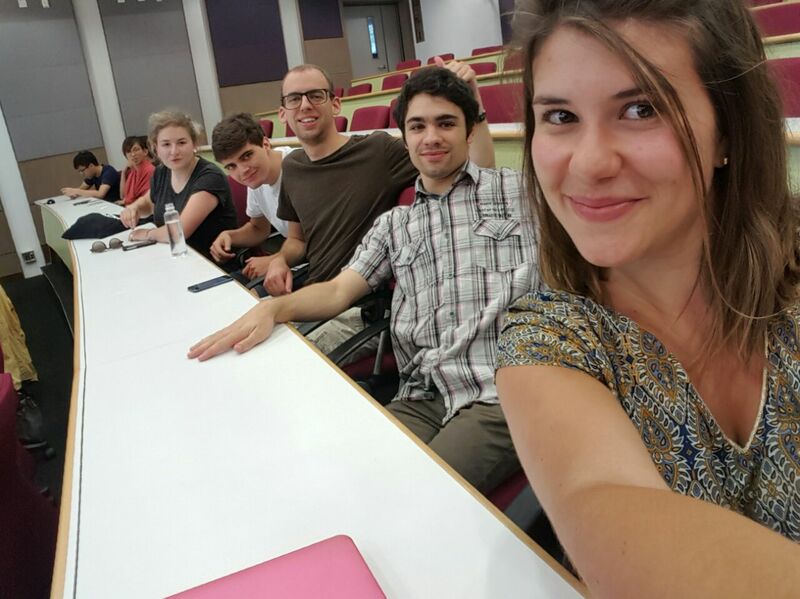 Lara worked mainly on the user interaction video (which is not finished yet, I’ll let you know as soon as it is!) and kept working on the LEDs for the prototype. 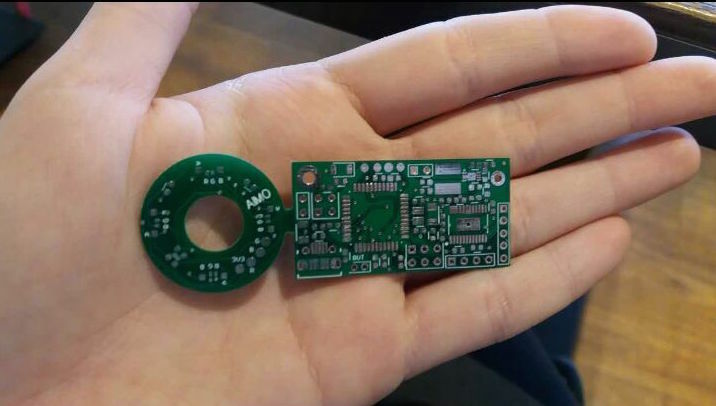 Link and Sorina put the firmware inside the PCB (basically, for those like me who don’t understand much about engineer stuff, it is when we put the beautiful code that Link wrote inside the PCB and therefore Aimo, so that you can use your mobile app and interact with your Aimo. Does that make sense? I hope so). 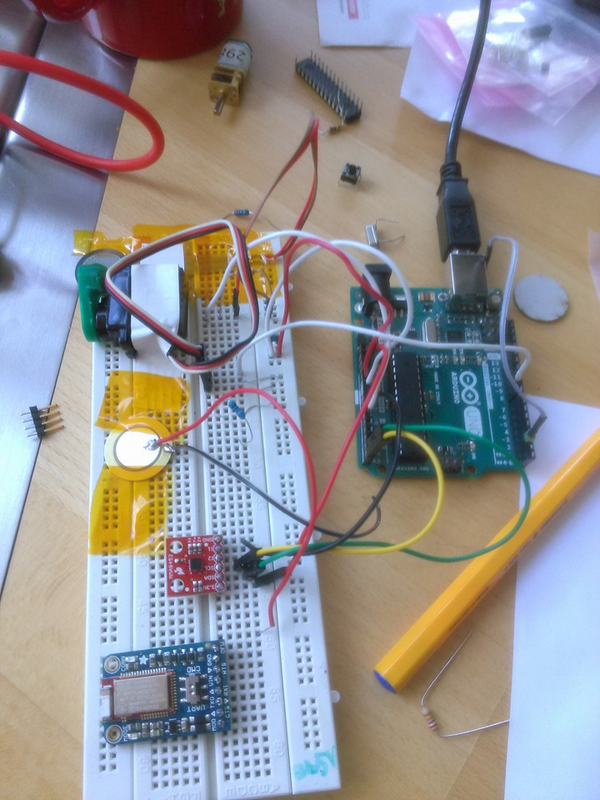 Link also kept on working on the app while Sorina managed to build 3 workable PCBs (YAY!). On my side, I was running around the whole day helping everyone. 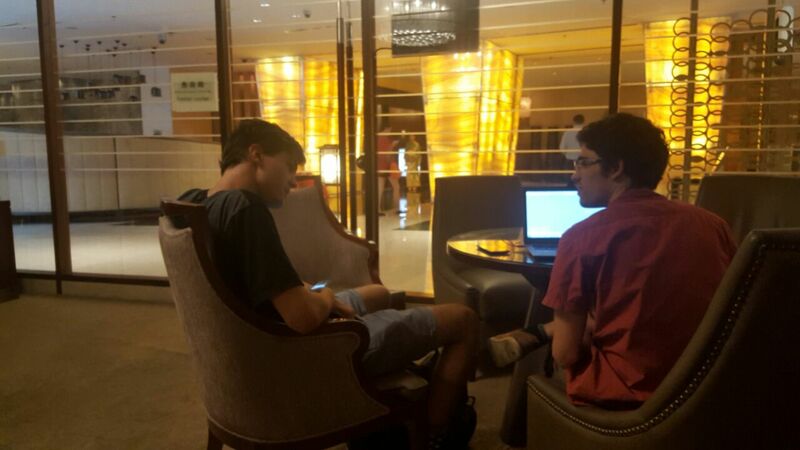 Alexis and JB stayed at the hotel to work on the design of Aimo. JB also made some renders of deposit boxes in real life environments! Then, I came back to the hotel, because we had an interesting appointment with Alexis and JB. Let me tell you more about that. 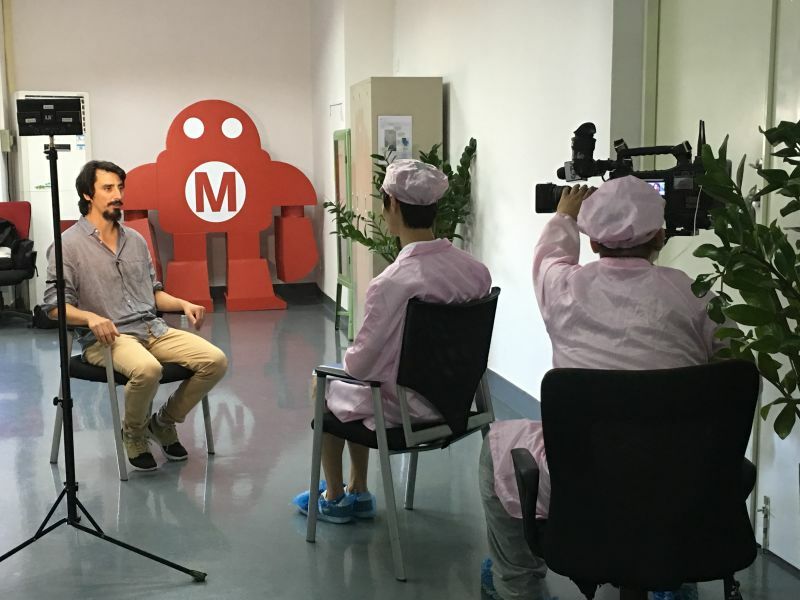 So you remember the other night when we pitched in front of Chinese makers? Well, there was a girl in the audience that knew a guy, which wasn’t there. 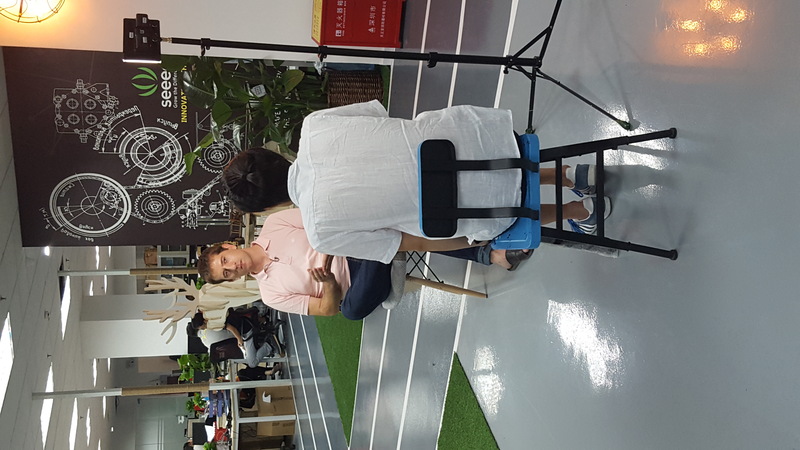 And it turns out that this guy, Carl, is a Canadian entrepreneur who has been living in China for a few years now and works in a maker space in the electronics market, the one we went to the other day. He heard about our product and wanted to talk to us about an eventual partnership because he is also working on a lock! 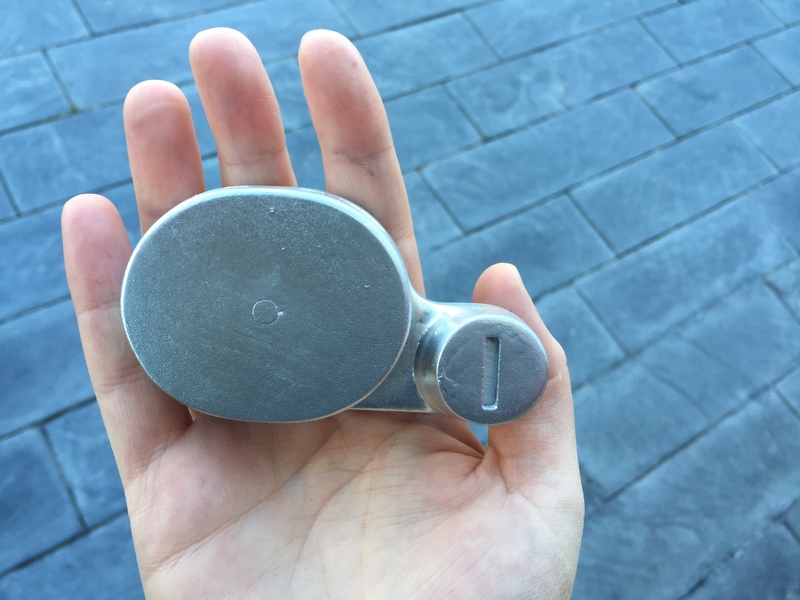 His lock is for Chinese house doors but he thought about putting together, as another product, his lock with our electronics and software to make another lock! That was really interesting and we are keeping in touch with him to see what is going to happen! That’s the beauty of China, you never know who you’re going to meet and what new opportunities might come to you. 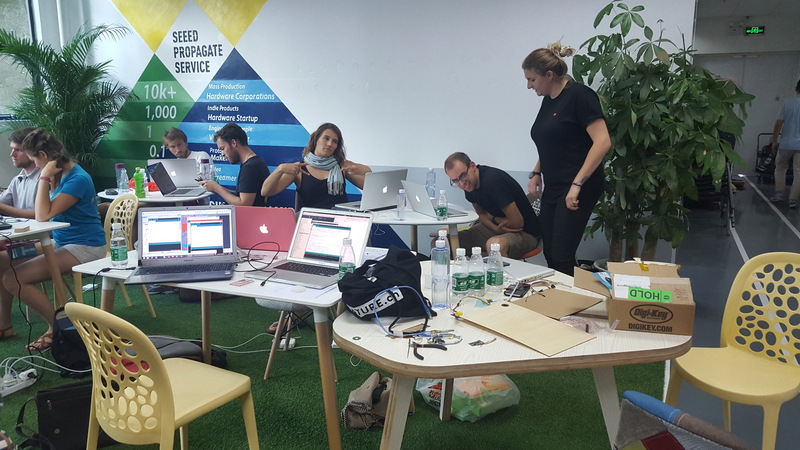 At the end of the day, we started the humanitarian hackathon as well! 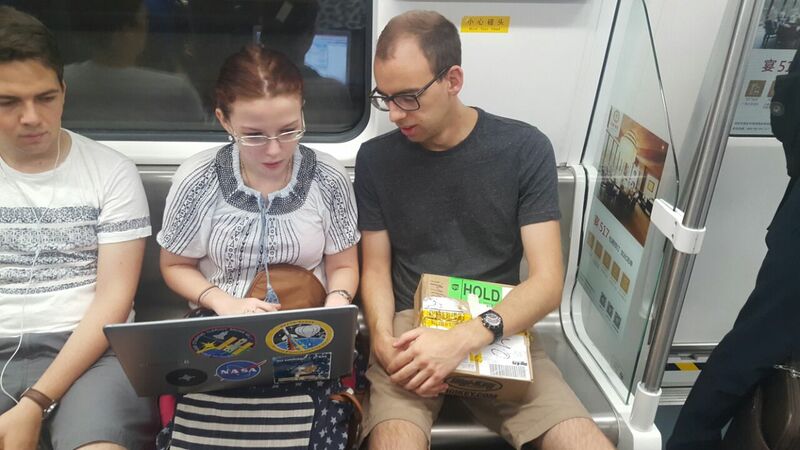 But before we were able to start, we had some adventures… We were supposed to meet everyone at 4:15 at a subway station, but with Alexis and JB we were late because of our meeting so we had to find the hackathon building by ourselves. Let me just tell you: that was not easy! It was supposed to take us 20 minutes and we ended up walking in the burning sun for 1 hour!!!!! But fortunately, we found it! 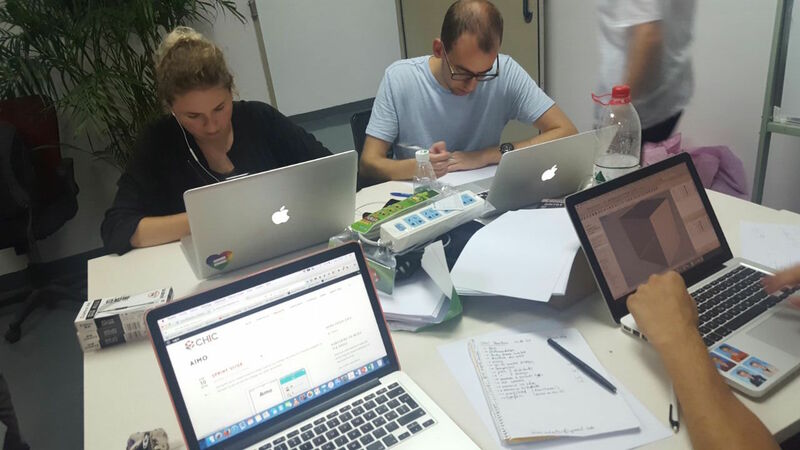 If you want to know more about the humanitarian hackathon, which was proposed by the ICRC, I suggest you to read the post on the CHIC blog! On Saturday, we spend the whole day at the hackathon and on Sunday, miracle, we had a day off!!!!! So most of us started by sleeping a little bit and then we did different activities such as visiting markets, visiting parks representing cities of the world, and just walking around! That was a good day! And on Monday and Tuesday we had different visits (for which you can find the detail on the common blog as well). I will update you soon on our last day of work on the prototype! Day 8 – Let there be light! After a delicious breakfast, all the 4 teams met in the lobby of the hotel to discuss with our supervisors the next steps of the projects. 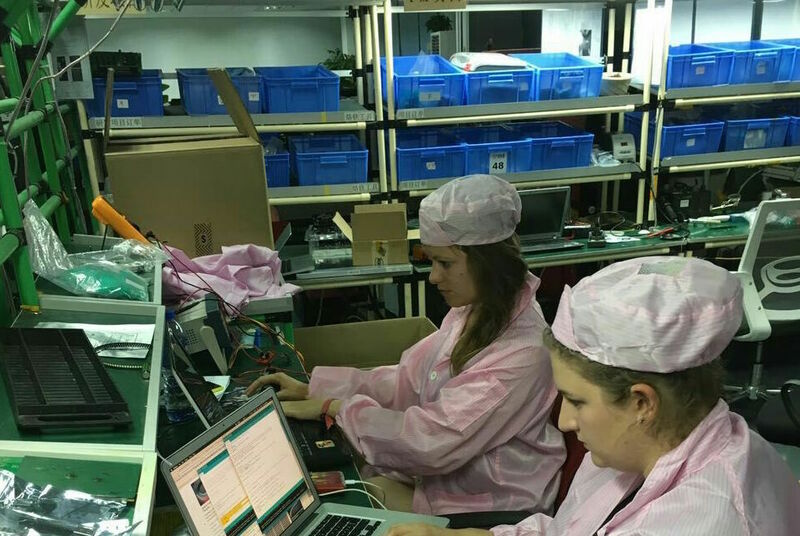 We decided to start with buying the missing components from the Chinese Electronics Market and then move forward with the PCB manufacturing at Seeedstudio. 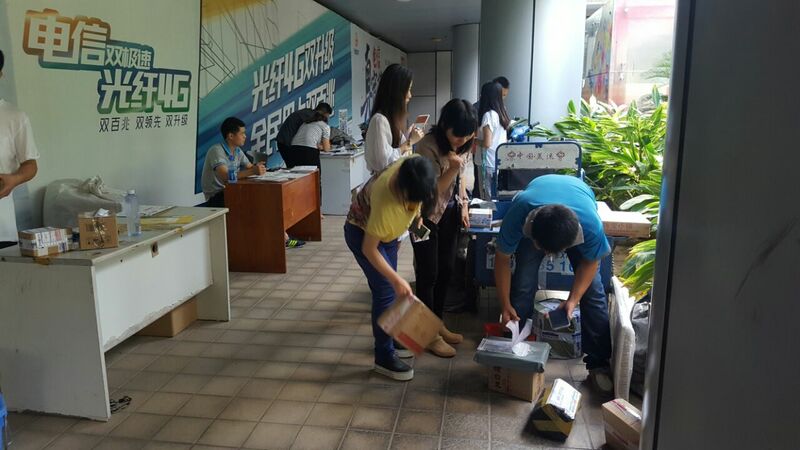 Our teams split in several groups and started the electronics rush. Basically, somewhere near a metro, there is a place, maybe as big as EPFL’s campus, where they sell everything you want (and do not want), from resistors and screws to laptops and cameras. Pretty amazing! The prices are quite high at the beginning, but the strategy to obtain a good deal is the following: they will give you an exagerated price, and then you start to decrease it as much as possible. In general, they will keep the price quite high but if you pretend angry/sad/almost leaving, they will give you the product really cheap. It is really a good psychological exercise. 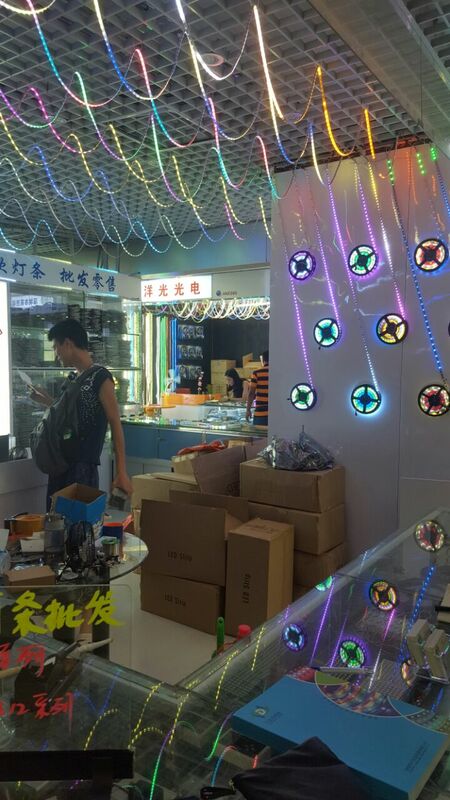 For example, the AIMO team bought 10 LEDs and 20 springs for a total of 1 RMB. 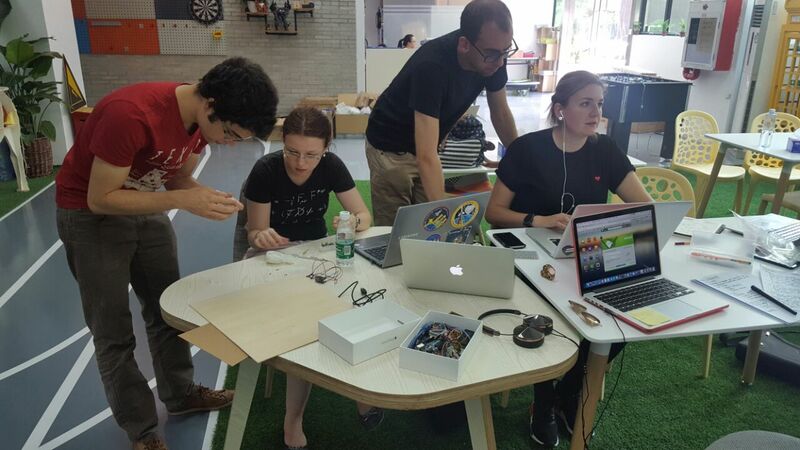 Most of the teams got their components at the market, and then we proceeded our journey to Seeedstudio. In the middle of our hard work, suddenly, it was a power-cut for two hours. 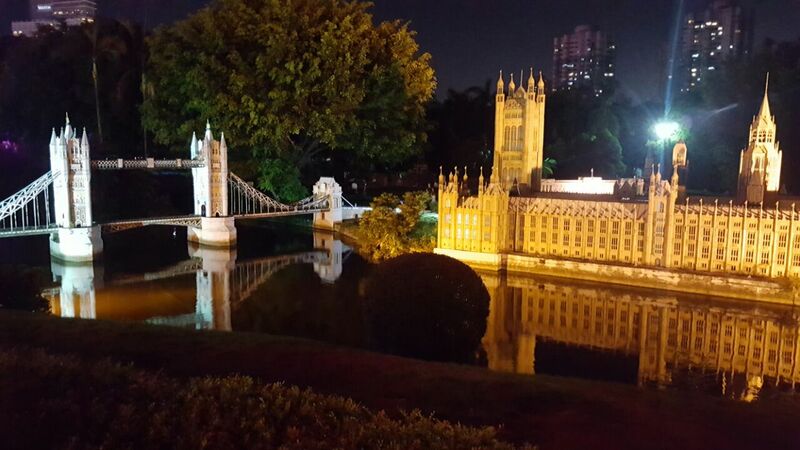 Fortunately, we are in a sunny city, so nature did its job and we managed to work even without artificial light. 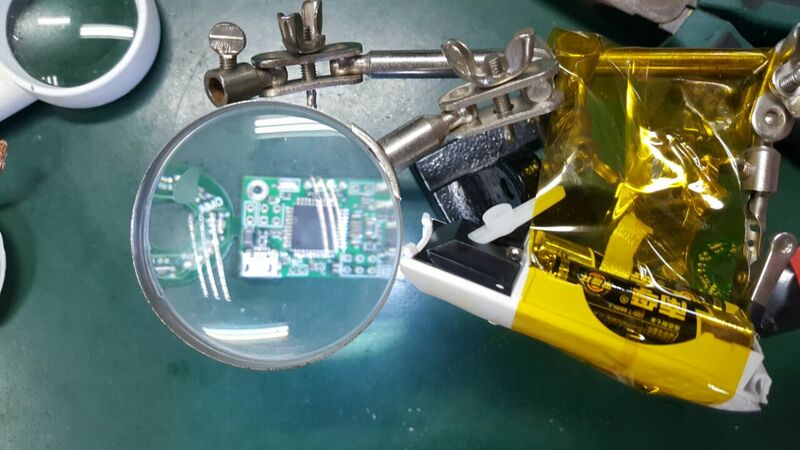 As we are also very creative people, we improvised some quick light-and-magnifying objects using a broken lighter, a servomotor tip and a normal magnifying lamp (picture below) to see how to pick and place those very tiny SMD resistors and capacitors. Finally, after 2 hours, light came back and then we managed to put the PCBs in the oven. Champaign!! They were cooked and ready to be eaten…I mean to be tested next day. Because we worked super late, we decided to come back by taxi. 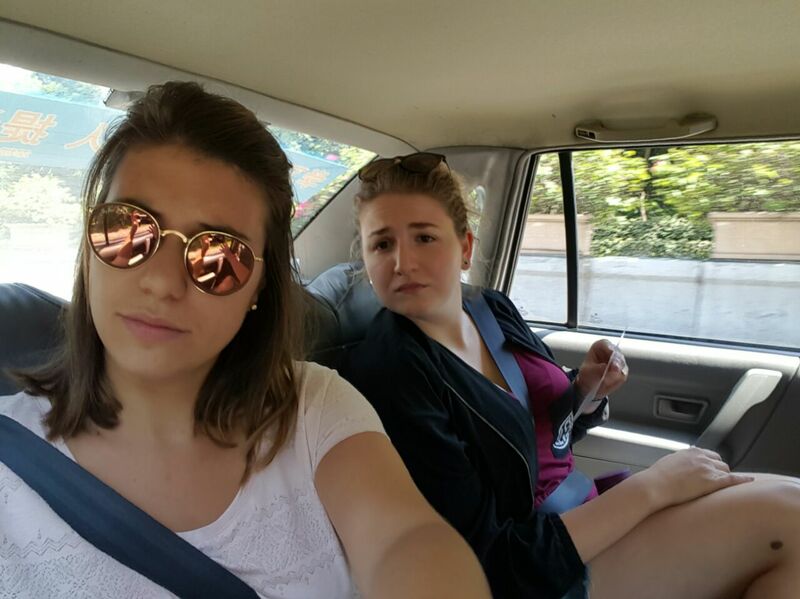 Of course, taking a normal taxi would be challenging, because we do not speak Chinese. So we decided for an UBER. After 4 trials of drivers coming and then …disappearing in a black hole, we finally managed to grab an Uber and arrive home. The best part was Lara’s birthday. Happy Birthday Lara! Bonne anniversaire! We enjoyed a lot the cake! Afterwards, we kind of all crashed in bed because of the long day of work. First visit of the day, Huawei. 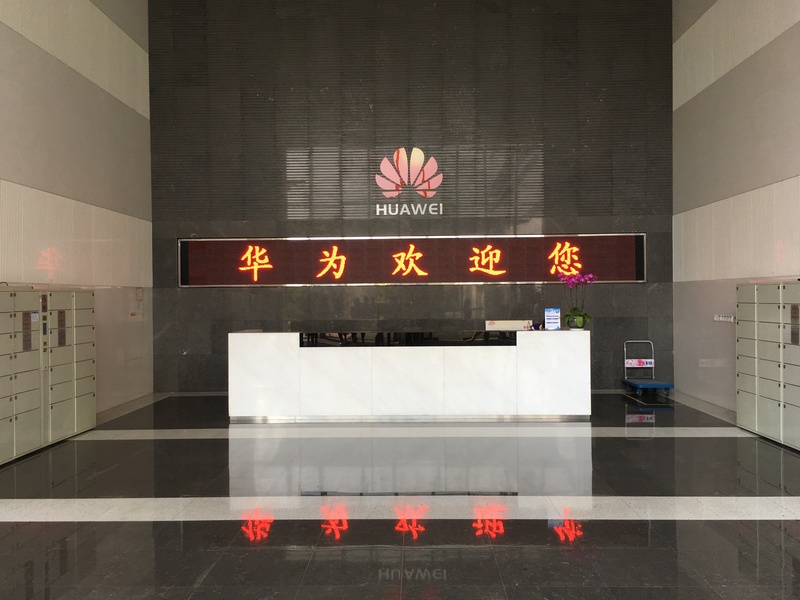 We met at the lobby at 7:30 to take the bus to the Huawei manufacture. There, we have been welcomed in a fancy meeting room with free tea and coffe. We had a presentation given by Steve. A lot of financial and business facts. Then a designer showed us the last model, the P9. 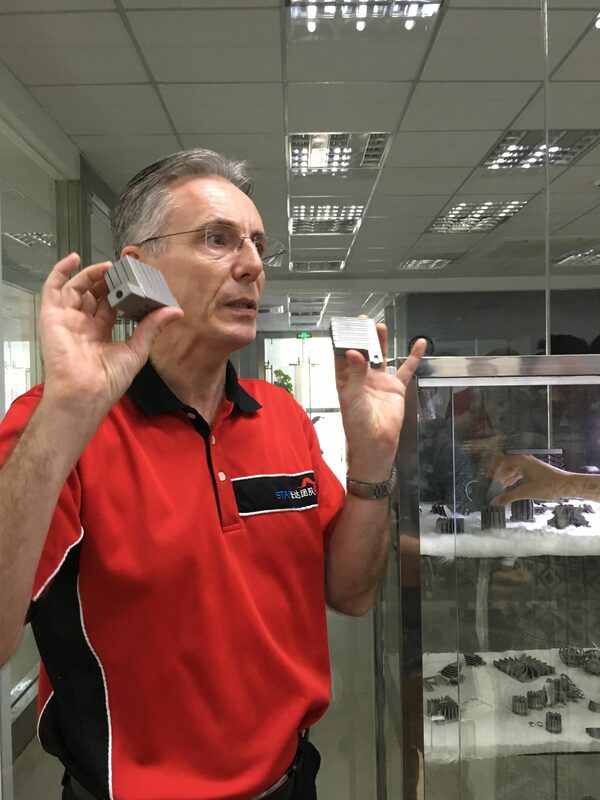 We had a lot of questions regarding the global trend of smartphone’s designs. 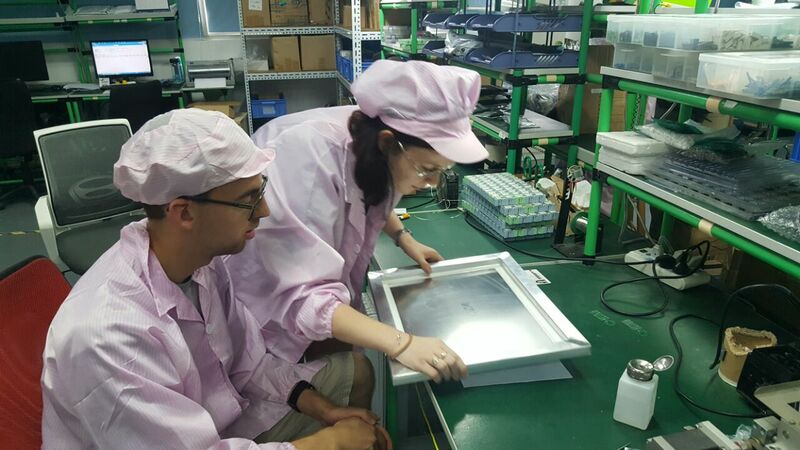 For the second part of the morning, we went to see a production line of the P9. Once you enter the building, no more electronic devices allowed (including usb sticks!) Sorry for the lack of pictures. We put hats and blouses and look-a-like teva’s sandals to enter the production line space. One production line equals 33 workers, 150 meters long. 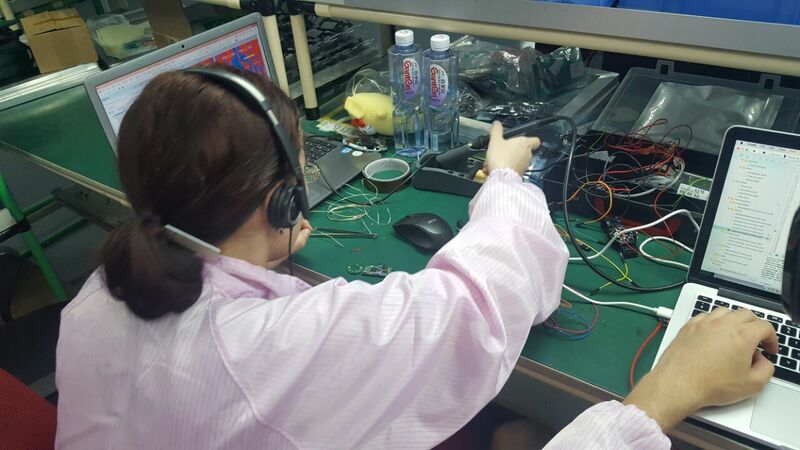 It start with a small PCB and finish as an operational and human tested phone in a box, ready to by shipped. The production line mixes precise human repetitive actions and highly perfomant imported swiss robots. Gordon, Levin and Jerry welcomed us with some fruit because we arrived right during the fruit break for the employees. 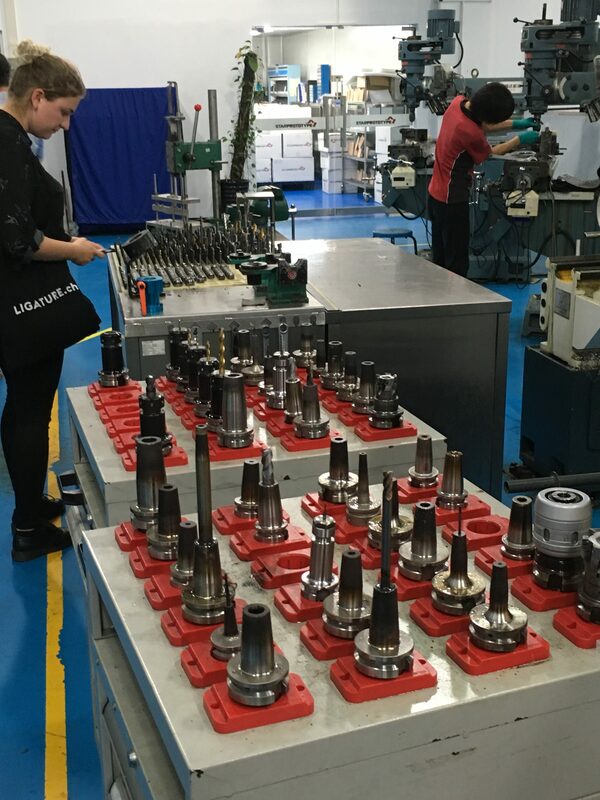 We split in 3 groups and we all went through all the different areas dedicated to each of Starprototype ways of producing: Vacuum casting, platstic injection molding, 5, 4, 3 axis CNC machines and 3D metal printing. They sometimes have special requests for super high precision, in this case every prototype is made by hand, by only one person through the whole process. 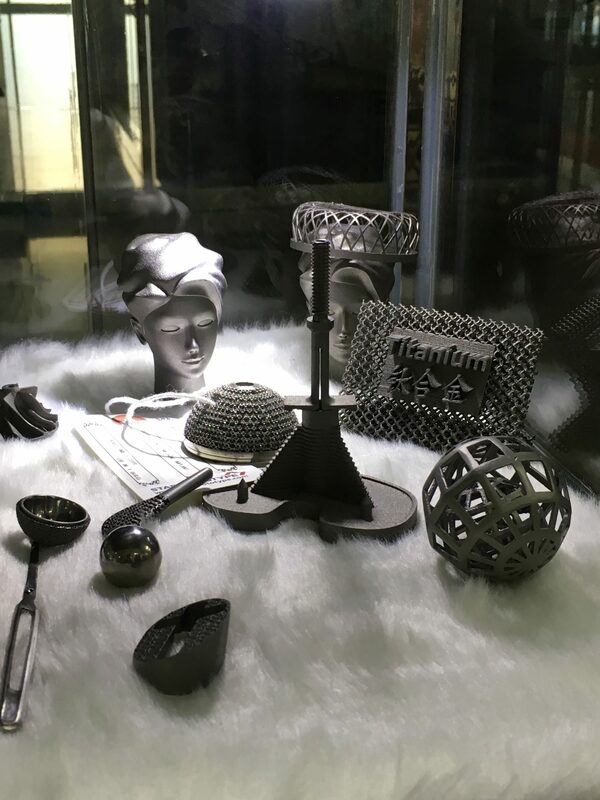 I think we all have been impressed by their metal 3D print, especially the mesh they can print for medical prothesis. Even if the compagny is based in China, it’s interesting to notice that the owner (who’s british) rules the place like a western business. We totally felt the difference during the visit. To finish the tour, they treated us with some Starbuck’s Coffee and some pizza from the café that Gordon also owns. 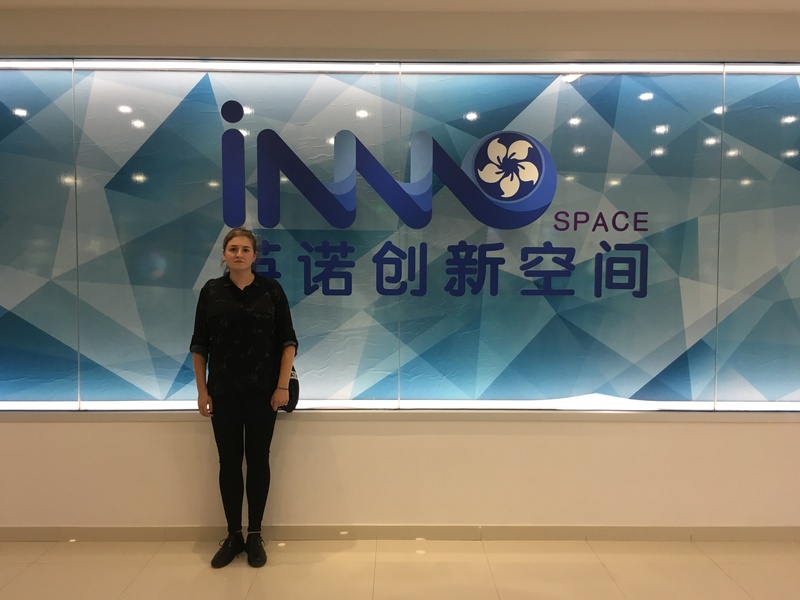 As we arrived quite in a rush to our last visit, they dismissed the tour of the manufactures but we still visited their brand new inno space. I don’t know if it’s because we arrived late or because they are still waiting for people to come working here, but the place left us a sort of an empty feeling. Let’s hope it will quickly change because the rooms are well equiped and full of potential. Finally, as we were starving to death after all theses pizzas, they took us to a fancy restaurant. P.S. 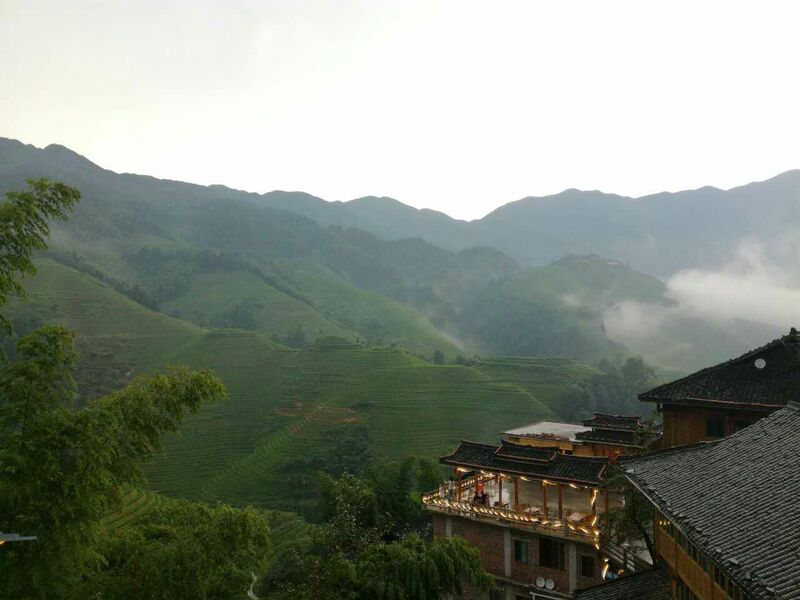 This place has the best wi-fi we experienced in China until now. 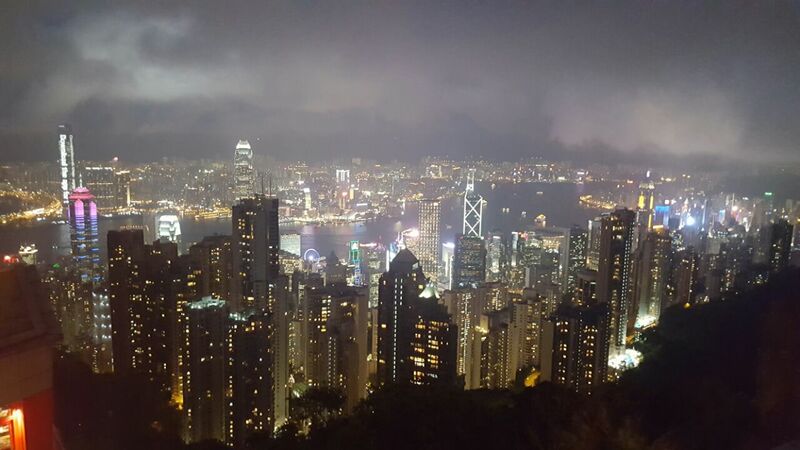 Day 4 – HKSTP and a view! All teams worked hard last night (or early in the morning) to prepare the pitching session of the day, this one for investors-oriented people at the Science & Technology Park. In the morning, we are given a warm welcome by Marian Gaultney, ex-banker now in charge of international partnerships. 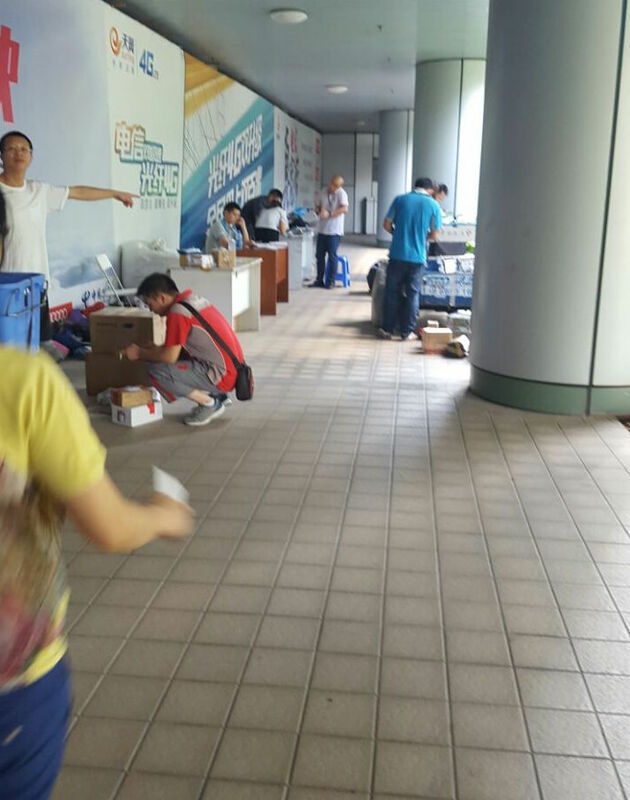 HKSTP seems to be the perfect place to innovate in Hong Kong, gathering start-ups and R&D centers of big companies. Young start-ups can make the most of this environment of technology and knowledge thanks to 3 incubation programs, from 18 months to 3 years. This campus has one mission we can sum up with 3C’s: Connect, Collaborate and Catalyze. Innovation here is supported by platforms dedicated to different fields of application: Smart Cities, Healthy Ageing & Robotics. Jury members have also a kind thought, awarding our projects as “the most disruptive project”, “the most creative project”, “the most marketable project” and ” the best social impact”. 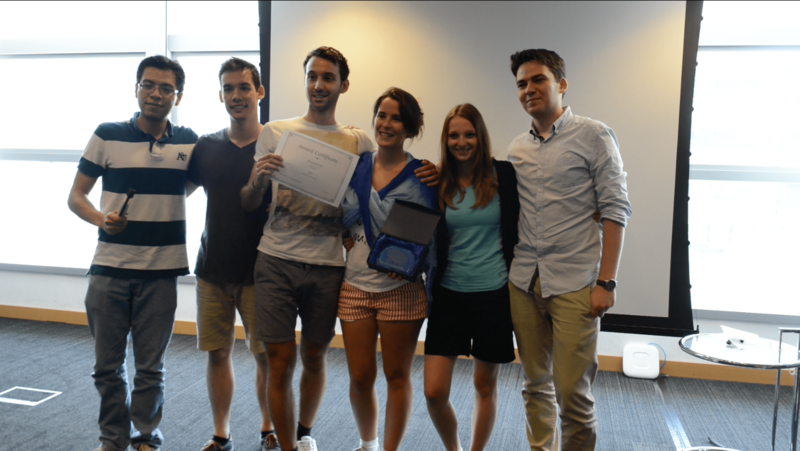 You can see the Tikku team with their award! After a feedback session and lunch, each team is invited to visit a company from Science Park, linked to its product and technology. 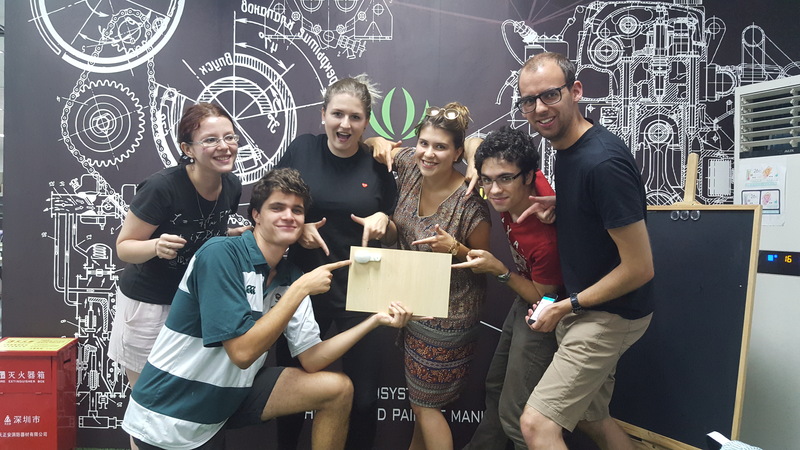 You can see on the picture the Okeep team with the CEO of the company their visited: Lexiwave. Then we met the people from Innokick. Innokick is a master program in Switzerland that allows students to acquire the necessary interdisciplinary skills required to develop innovative products and services and to market them successfully. 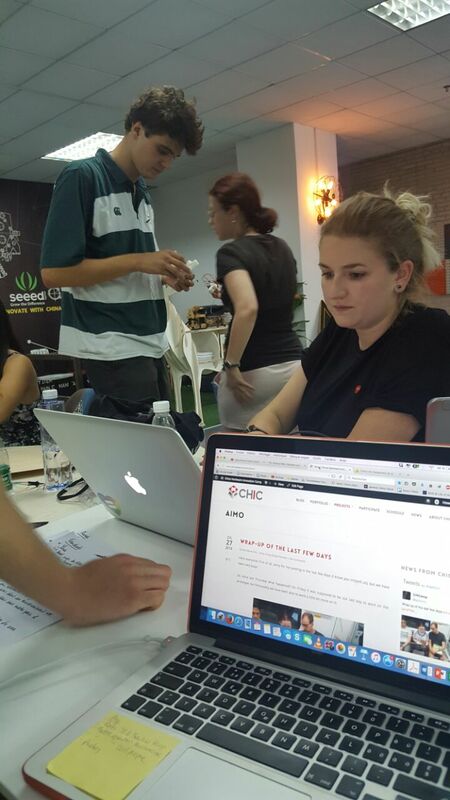 They explain their project to us, they have been working on integrating business 4.0 into Hong-Kong’s companies. They tell us their feelings about the culture difference in Asia. We did a small version of our speeches to them as well, without slides for the first time, which was very challenging. 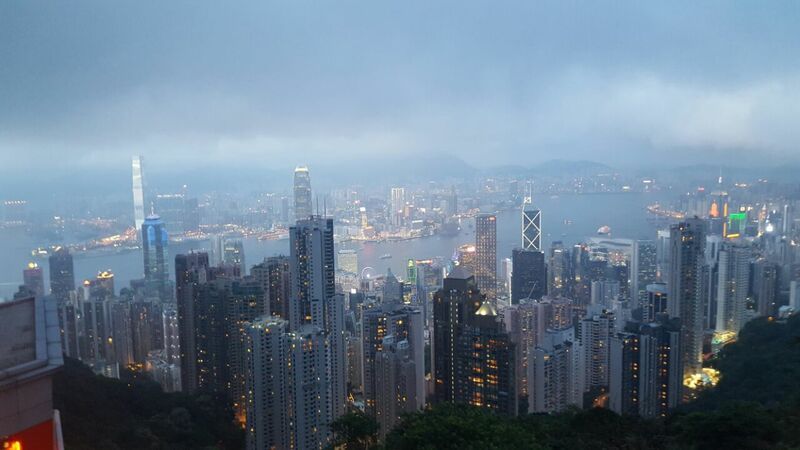 At the end of the day we took the bus and went to the Victoria Peak. 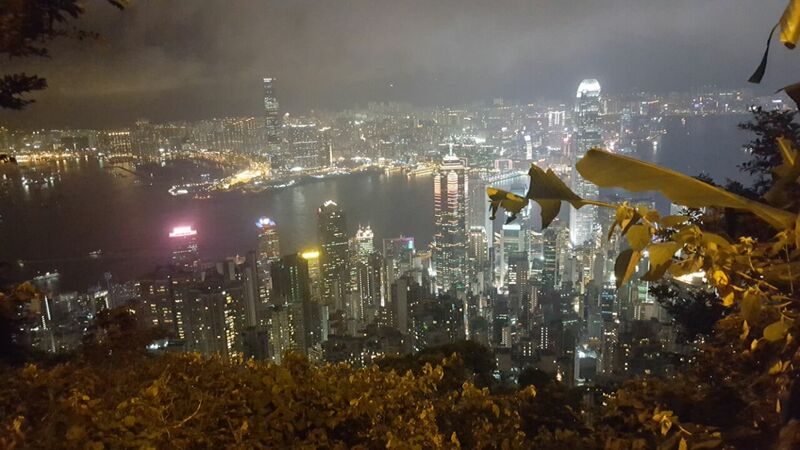 It’s a mountain that surrounds the city of Hong-Kong. 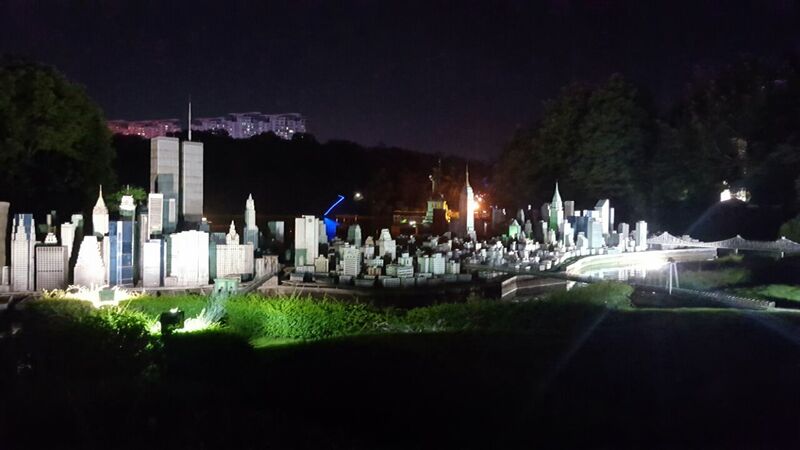 We enjoyed a beautiful view and were impressed by the density of buildings and the lights. We then followed Marc on a small walk from the top to the bottom of the mountain, so back to the city center. The path was very steep but we made it. 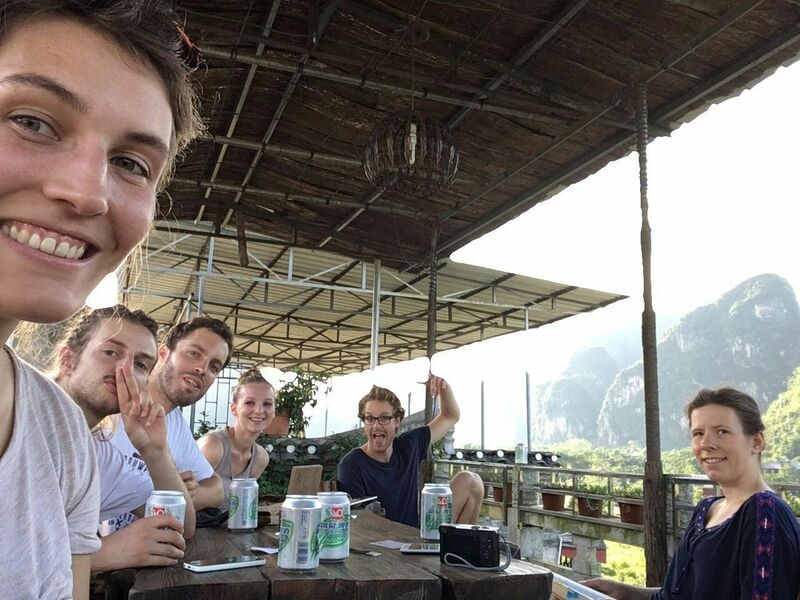 We arrived right in the middle of the city and we enjoyed some beers before going to sleep. What have we been up to today? Well, a bunch of things actually! Lara and I started the day in a pretty stressful way since we had some trouble waking up this morning (I have to admit that we were 5 minutes late to the morning meeting), but fortunately everyone waited for us! 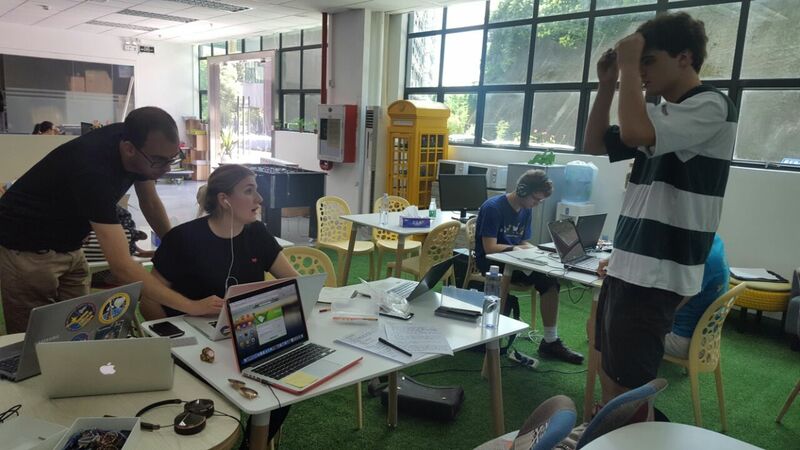 So we started the day by going to HAX, which is an accelerator for start-ups. 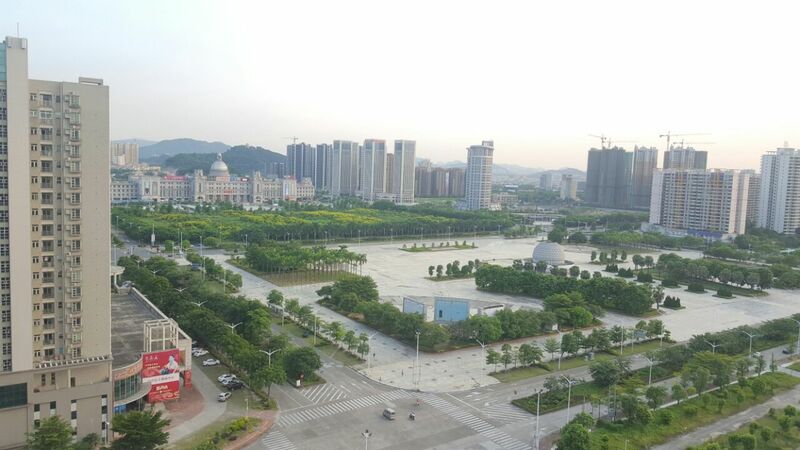 They offer a 6 months program, in Shenzhen, to innovative groups of people coming with great ideas. It was very interesting and our host, Benjamin, welcomed us very warmly. He started by presenting us the company and by presenting us a few projects that they have been supporting lately, and there were some pretty amazing things! After the introduction speech, we had a very interesting interactive session of Q&As where Benjamin gave us some insights about the start-ups world. Then, all the teams pitched and got a very relevant feedback from Benjamin and an expert designer. It is always so interesting to pitch in front of experienced people who don’t know your project, because every audience always brings up ideas or comments that make us move forward! So that was about it for the morning. 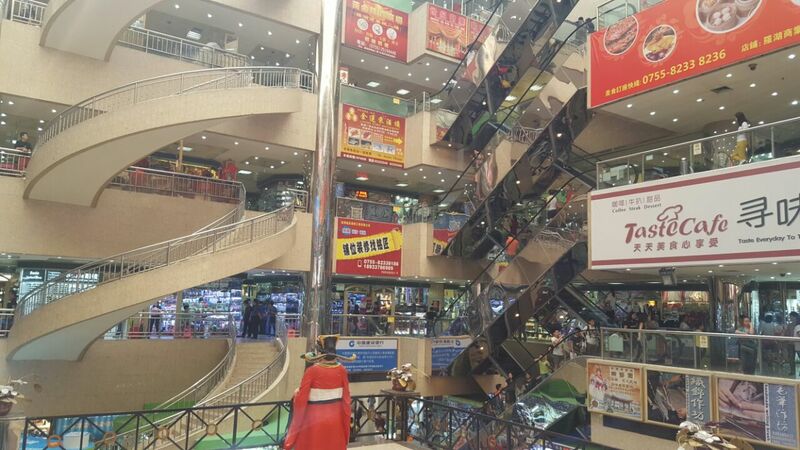 In the afternoon we moved to the electronics market in Huaqiangbei, where Sorina and JB went already the other day, to get some missing components. 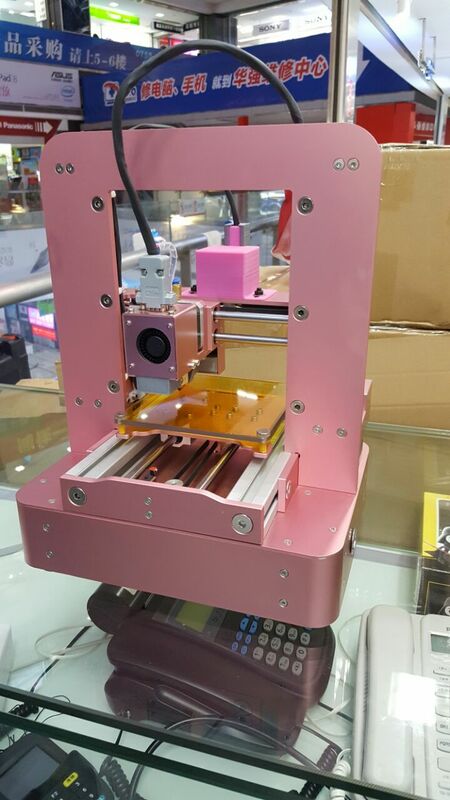 We also went there because, thanks to the Hibachi team, we discovered that there is a stand there that does 3D printing, in good quality. So we know that in case of any trouble or emergency we always have a backup plan! I went with JB and Lara to look for some LEDs that are going to be between the button and the base of Aimo while Alexis and Link looked for a motor on their side. This market is so big you can find anything! And the prices are just not comparable to what we could imagine in Switzerland! 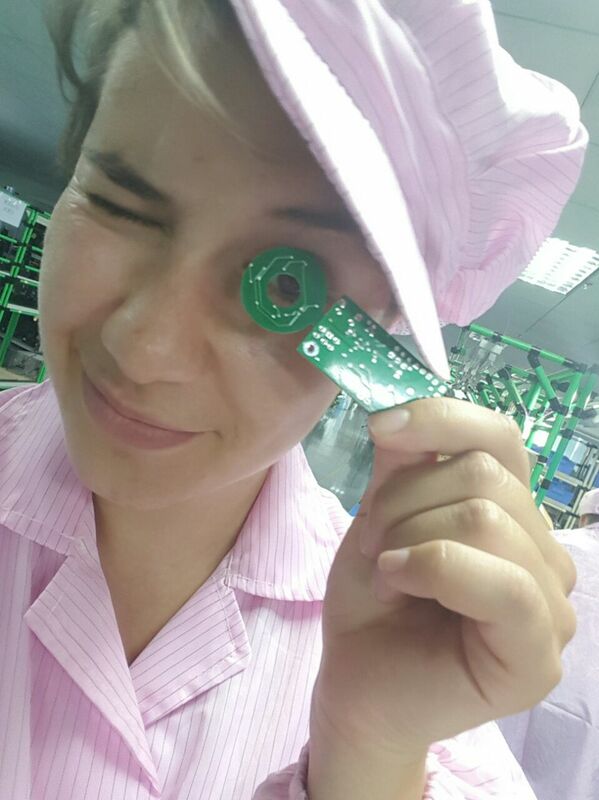 While we were at the market, Sorina went back to Seeed in order to keep the work on our beautiful PCBs. 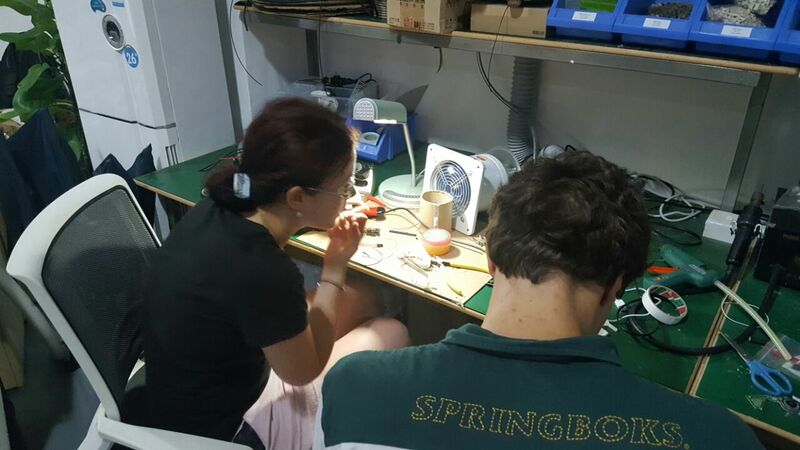 Later, Lara and JB joined Sorina at Seeed where Lara worked very hard not to burn our PCBs and she managed to make the LEDs that we bought earlier at the market work! Yay! JB fought with the Internet connexion in order to finish and post his article for the CHIC blog and kept reviewing the design as well. Alexis, Link and I went back to the hotel to work. The guys actually didn’t find the motor they were looking for at the market to they bought instead a DVD player that they disassembled in order to get the motor that was inside (this is the kind that we need!). Always good to be handy! Link then kept working on the app while listening to a old but gold playlist while Alexis was most of the day with Link, and later he reviewed the mechanical design in order ti make it printable in steel! Exciting news, right! On my side, well I wrote this post and worked on the business model for deposit boxes in neighborhoods and Aimo lockers in public places such as train stations, airports or universities for example. 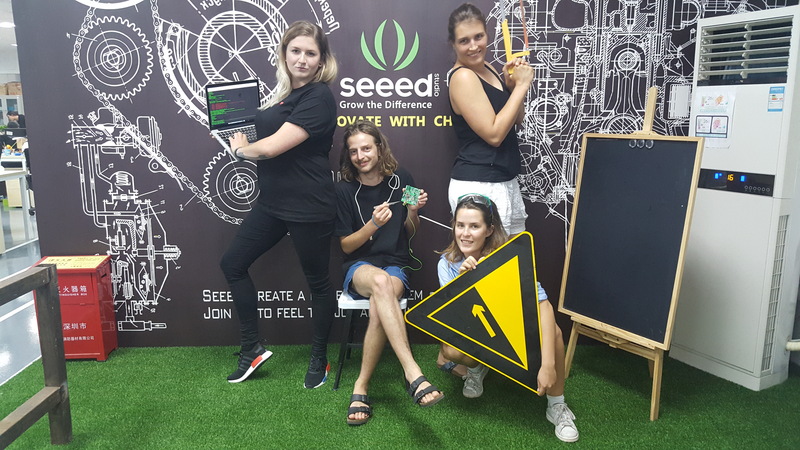 Tomorrow is going to be our last day at Seeed so we’ll need to be suuuuuuper efficient so that, I hope, we’ll be able to show you the results of our hard work! Stay tuned! Hello again ! Twice in one day, how lucky are you? So today we also split up the team, in 2 groups. Sorina and Link went to Seeed Studio to work on the PCBs and the software, Alexis, JB and Lara stayed at the hotel to work and I went observing the Chinese environment this morning and came back at the hotel in the afternoon. More specifically, Sorina worked on the PCBs and tested if all the components were working properly. 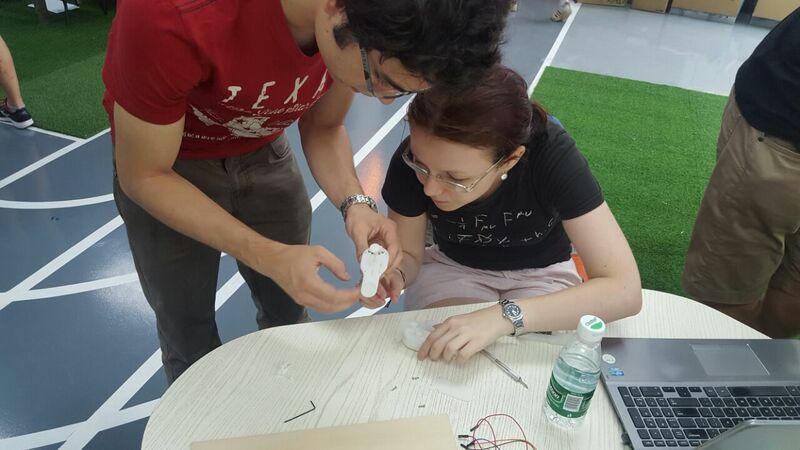 She also tried to transfer a simple code into the PCB but unfortunately it failed. But that happens, right? And no worries, she’ll make it work for tomorrow, no worries! 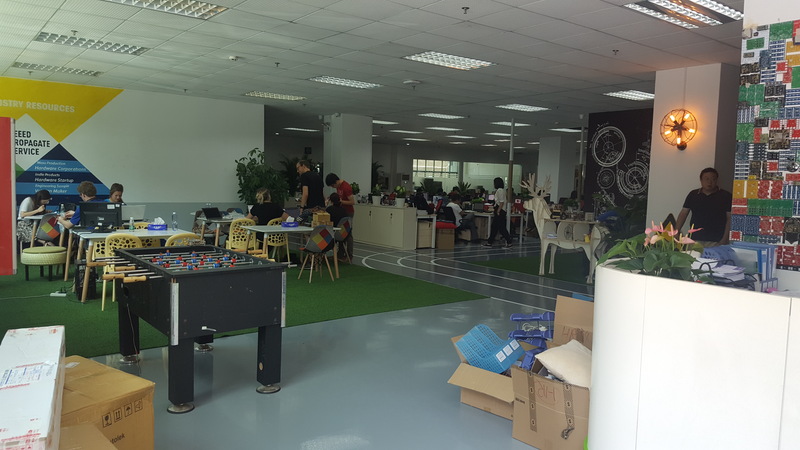 She still needs one component to completely finish the PCB but I forgot to tell you that Seeed Studio is moving its offices this week so we are working between both offices actually. About the components that I was telling you about, unfortunately since everything at Seeed was packed, we couldn’t access it. Link continued working on the mobile app, especially on the feature that allows the users to share keys by email, which is almost fully operational now. Thumbs up! I told you before that the Internet connection was pretty bad there so it was difficult for Link to be as productive as he usually is in Switzerland, but you know, it’s part of the experience! And I have to say that thanks to him we have some pictures of what happened today at Seeds! So thanks! They (Sorina and Link) also reported some interesting habits from Seeed Studio. For example, around noon all the lights are switched off and the employees start sleeping at their desks for about 30 minutes! (I always knew that a turbo nap was powerful, I practice them myself!). 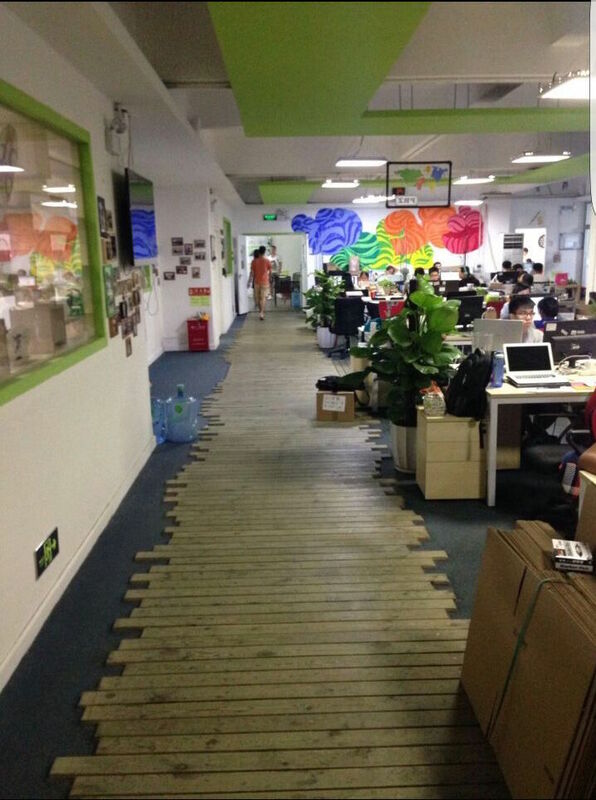 Also, later in the afternoon, some relaxing music is diffused through the whole office and the employees massage their own faces (apparently it helps for people who are working in front of a computer all day long, which I completely believe)! 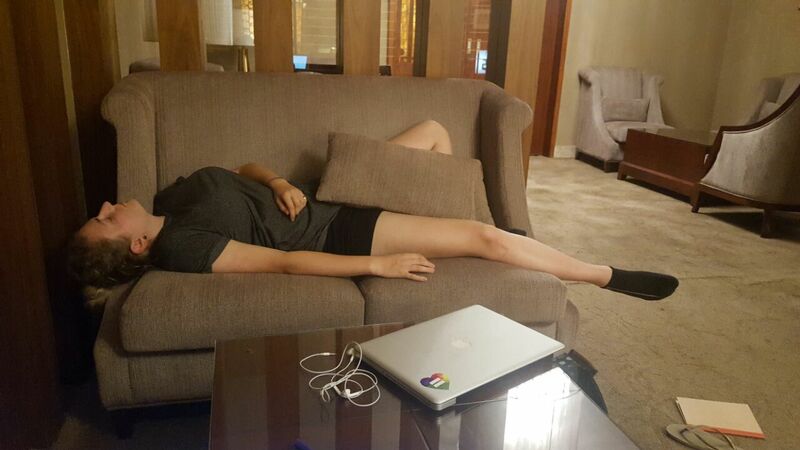 At the hotel, Alexis finished the mechanical design for the first iteration of the functional mechanics, which is a great news! He also worked closely with JB, who finished the design for the public deposit boxes and worked with Alexis on the detail of the device. So they both worked to implement and improve the aesthetics of the design and packed everything so that we were able to send everything to the manufacturer! 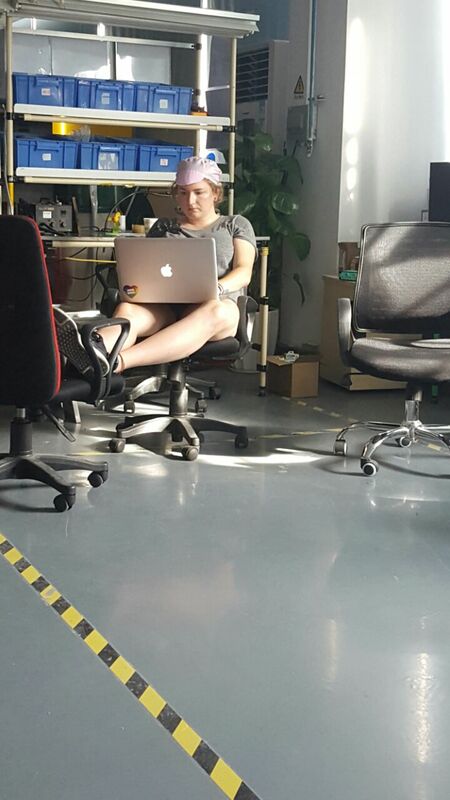 Alexis even started to work on the second iteration that should be possible to manufacture using common machine tools such as CNC or turret lathe, or using steel 3D printing! 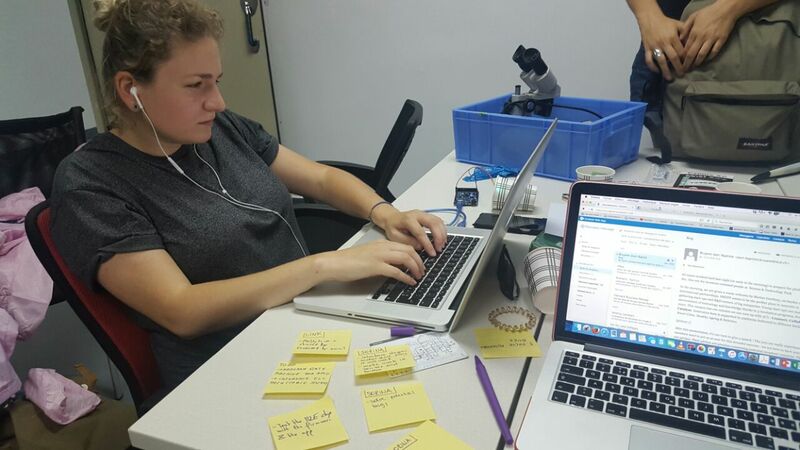 Lara on her side worked on our website in order to make in shiny and beautiful! 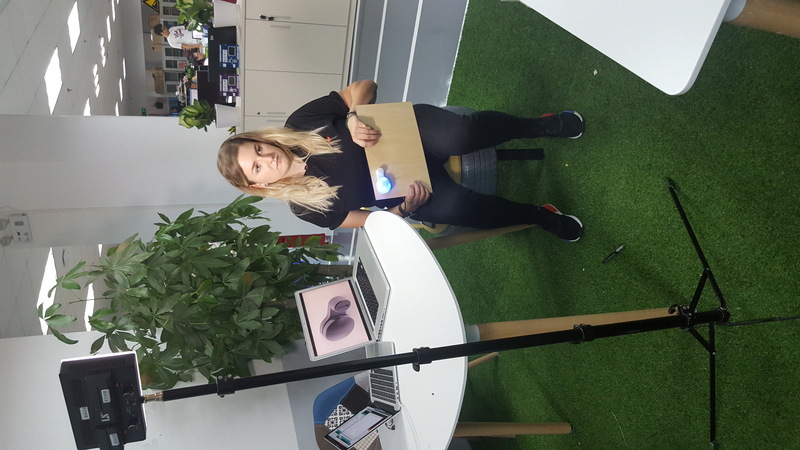 She also did some anticipated work for Sorina in templating the light interaction of Aimo, so basically it’s the information that is communicated through the LEDs. I have to admit that she took a little nap as well, but it was fully deserved after such hard work! 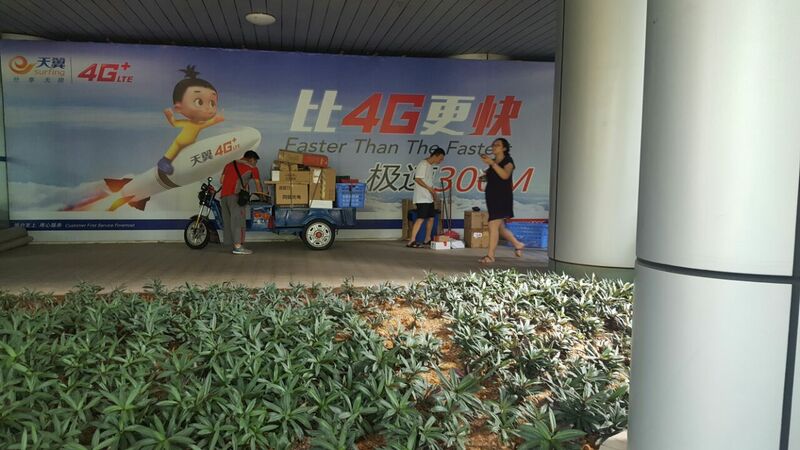 And finally, as you could read on the previous article, I went on a field operation this morning in order to observe the Chinese behavior related to our product. Then, I wrote the article and reviewed our slides for the pitch that we had tonight! Indeed, Link and I pitched in front of Chinese makers this evening, and it was a very interesting experience because not all of the audience was speaking English, so fortunately we have a Chinese student, Yumeng, in our program that did an amazing job in translating all of our pitches to the audience! That was very impressive! We got some interesting questions, as the Chinese behaviors related to mailboxes are completely different from ours here! So to sum up it was again a very interesting and busy day for us all in the Aimo team, and we are excited to see what comes next! Stay tuned! 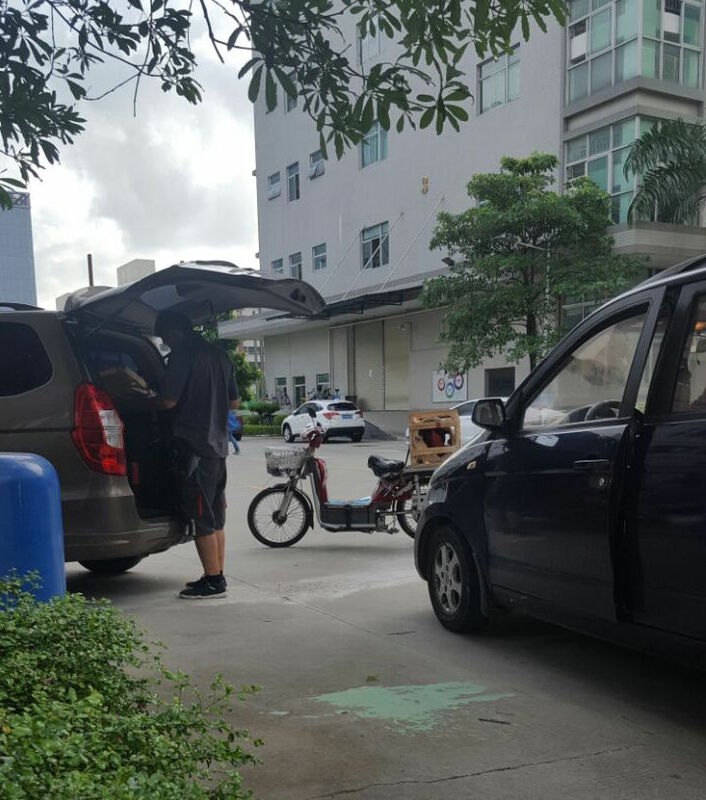 I have been walking around Shenzhen (well mostly around the hotel) in order to observe the behavior of the Chinese people regarding mailboxes and other topics related to our project. So the main things I’m looking for are: mailboxes, post offices, public deposit boxes in subway or train stations, as well as behaviors of people interacting with these objects. In a shopping mall I saw some small free lockers, but useable only with a receipt of a shop within the center, using the code bar. But as you can see on the picture, the revenue stream here comes from the publicity. I didn’t find any similar product to ours but obviously I haven’t looked everywhere so we can’t say that we’re completely safe. 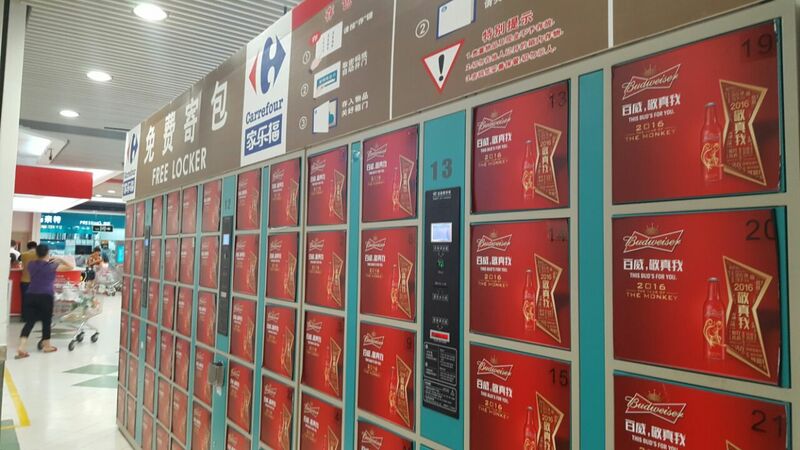 We also saw some other lockers in a 7eleven (the little shops in China) near a beach in Hong Kong. They didn’t work with a key but with a code and weren’t free this time. Other than that, we didn’t see any lockers in the subway or railway stations. We need to look farther in the subway stations but apparently in the railway stations you won’t find them. There are luggage rooms instead. But you have to remember that the railway stations in China are much bigger than in Switzerland, and you take the train only for long trips, you would compare the train stations of Switzerland more with subway stations in China. Regarding how the mail system works in China, well first of all we have to split this in 2 categories: the parcels and the letters. 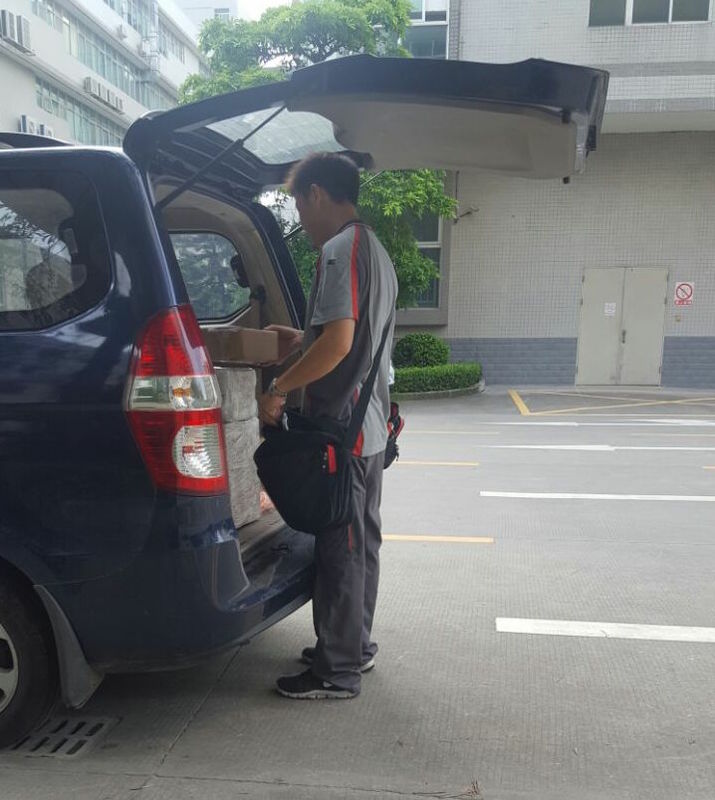 For the parcels, Chinese people don’t use the Post but private delivery companies instead. In order to deliver the parcels, the delivery man will call the customer to agree on a delivery time so that they don’t miss each other. If they do miss each other anyway, the delivery guy takes the package back with him and the customer will have to pay extra fees to get his or her parcel. No Post involved here. Pretty inconvenient, right? Regarding the letters now, you need to know that you don’t get a mailbox by definition. If you want one, you have to rent one (and it’s not cheap!) in the building where you live, to the Post office or to the owner of the building. In this case, you will get your letters at home. If you don’t rent a personal mailbox, then you have the possibility to sign up at your local pPst office to rent a mailbox there or you can just get a phone call every time you receive a letter at the Post office so that you can go and get it. Pretty complicated as well, right? 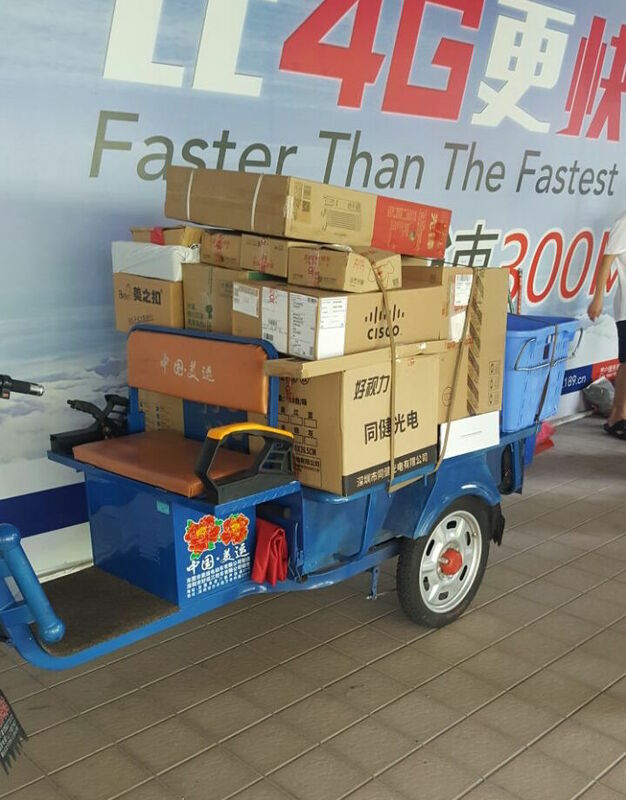 So just a few desks outside in the streets, some delivery guys driving a scooter with all the parcels on them (and they don’t wear a helmet, obviously) and the customers, well the people, coming by to get their mail. I was pretty surprise to see that in a city as modern as Shenzhen, the mail system seems so “old-fashioned” and not optimized. I haven’t been able to see any mailboxes yet, as surprising as it sounds, because there are always guards at the entrances of the buildings along with big portals. But I’ve been told that I should try to go in anyway, so that’s what I’ll do tomorrow probably in order to be able to show you a few pictures! 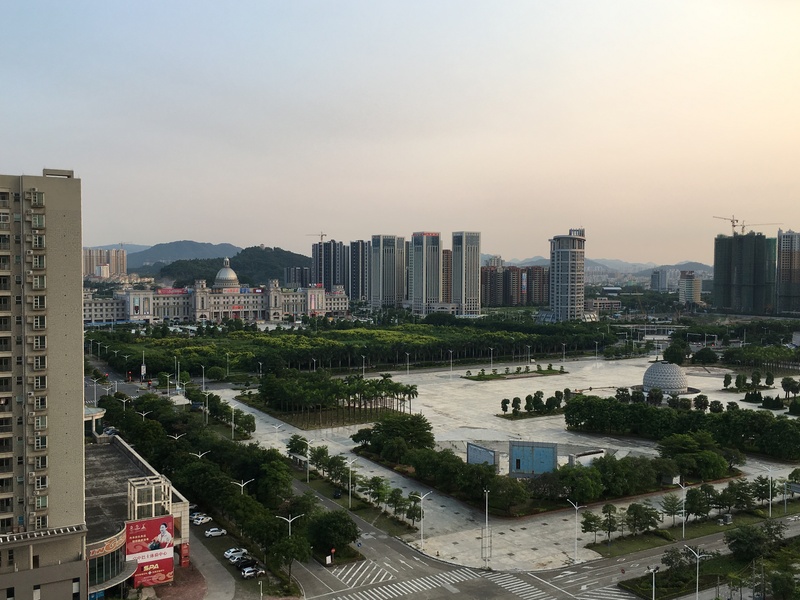 In conclusion, we can say that China (well at least Shenzhen since it’s what I’ve been observing) would be a great market for us, we could really bring some improvements here. Imagine if we just put some Aimo deposit boxes in different neighborhoods, then the customers wouldn’t have to arrange an appointment with the delivery man to agree on a specific time and wouldn’t have to pay extra fees in case they miss the delivery. 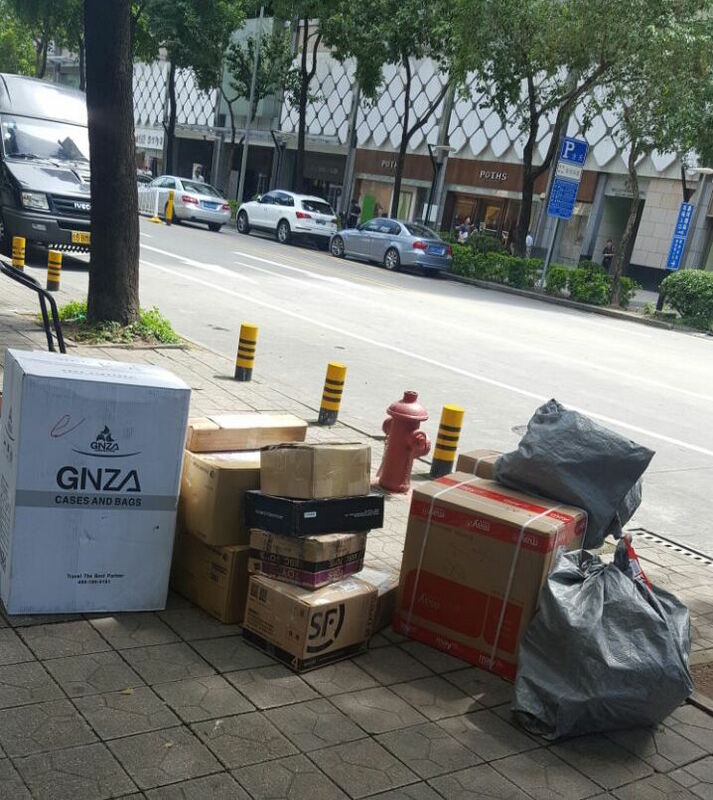 On the other side, the delivery guys wouldn’t have to be slowed by specific timings, they could just drop the parcels in the deposit boxes whenever and so be able to be more efficient during the day. 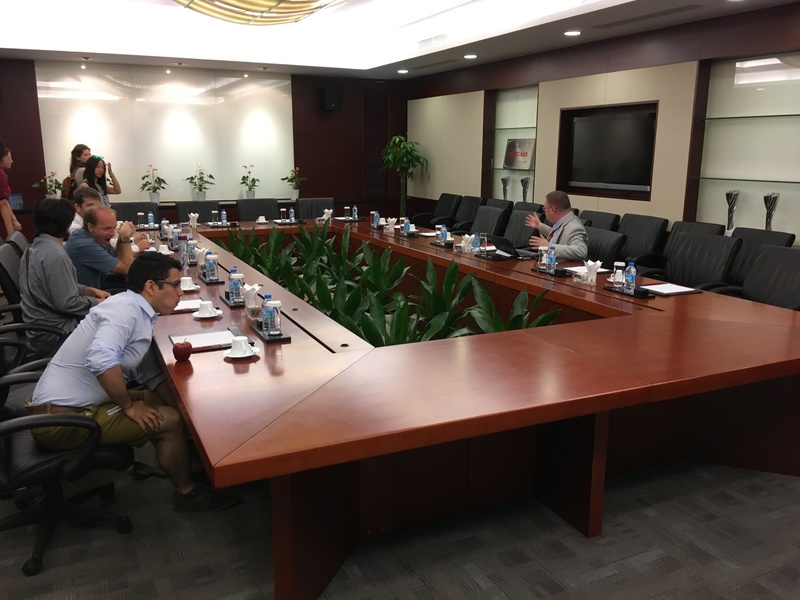 We need to check the regulations regarding the personal mailboxes as well and the deposit boxes in common spaces, but I’m confident that China should be Aimo’s next destination! First of all, today was Lara’s birthday so it was gonna be a good day anyway!!! What a busy day! 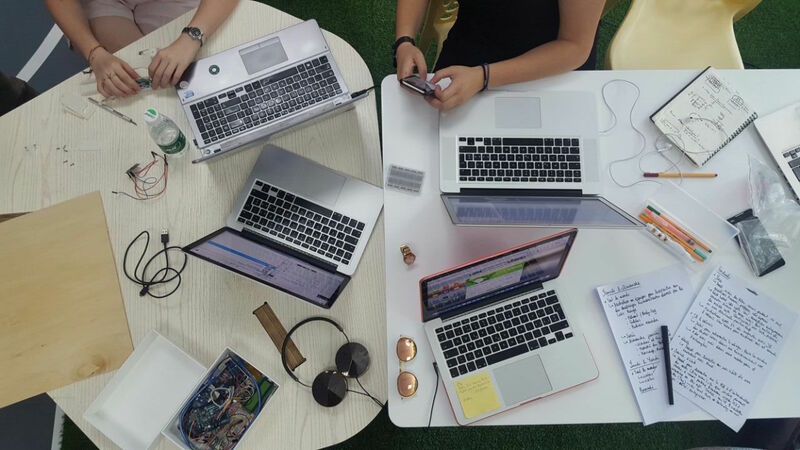 The team actually split up to do some different things in order to be more efficient. 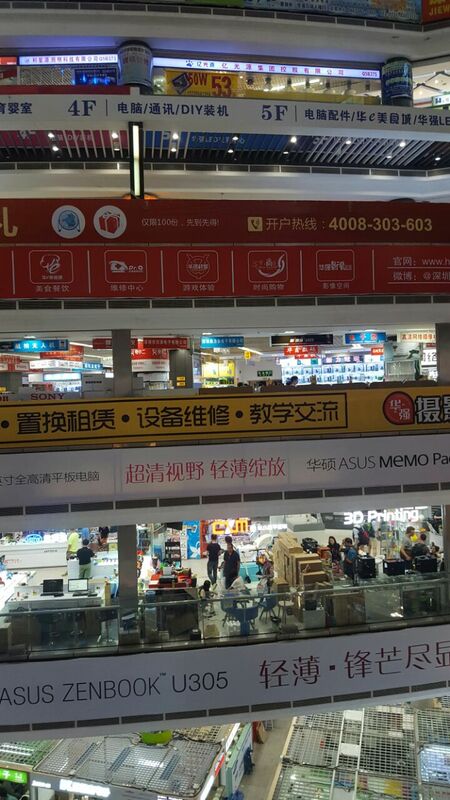 Since we checked the components required for the PCBs last night and noticed that we were missing some of them, Sorina and JB went to the electronics market in Huaqiangbei this morning to bargain to get the missing components. I heard that they were pretty successful so that’s a good thing! 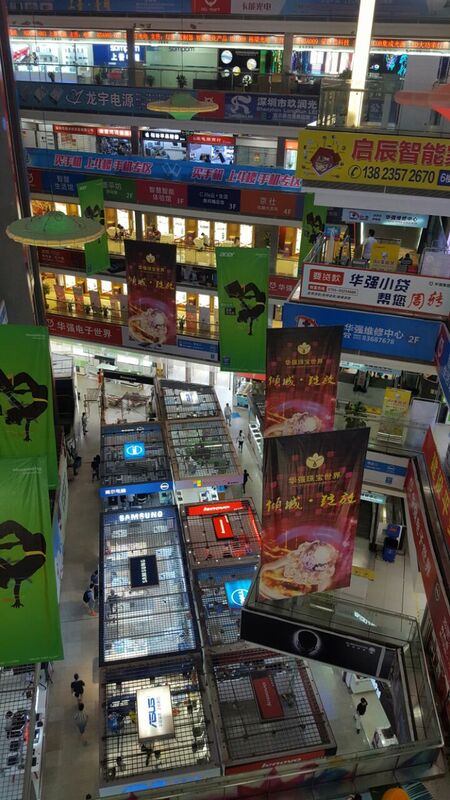 Lara, Link and Alexis stayed at the hotel to worked this morning and I went with the other HEC students to a “field trip” in order to observe the Chinese market for our respective projects. So we went to a mall and we walked around in order to try to find similar objects to ours. We also tried to talk to some people but unfortunately most of the people there don’t speak English so you can imagine the difficulty to communicate. 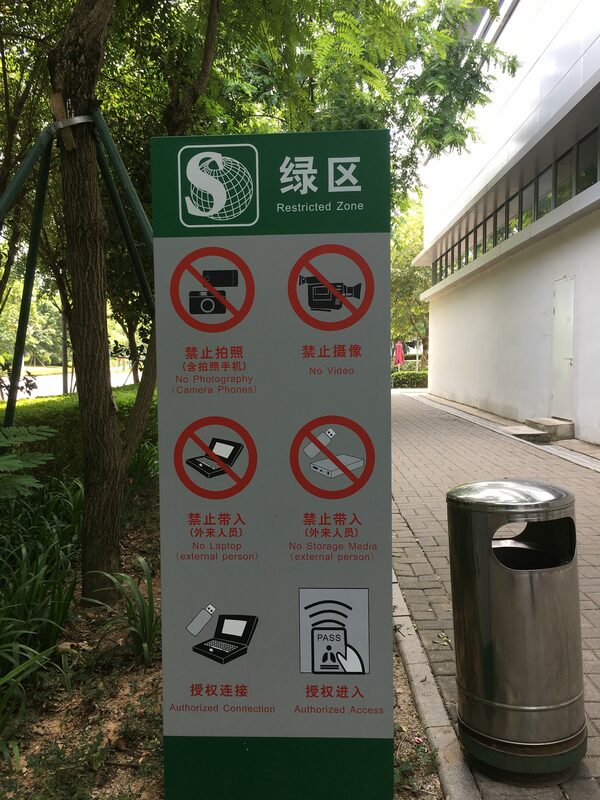 I was impressed to learn that most of the people in Shenzhen (I don’t know hoe it works in the rest of China) don’t have a mailbox. If they want one, they need to rent it or if they don’t want this option, they get a call from the post office when they get a letter and they need to go there to pick it up. Pretty complicated right! So I think that once we’re well established in Europe, China is definitely going to be our target market! 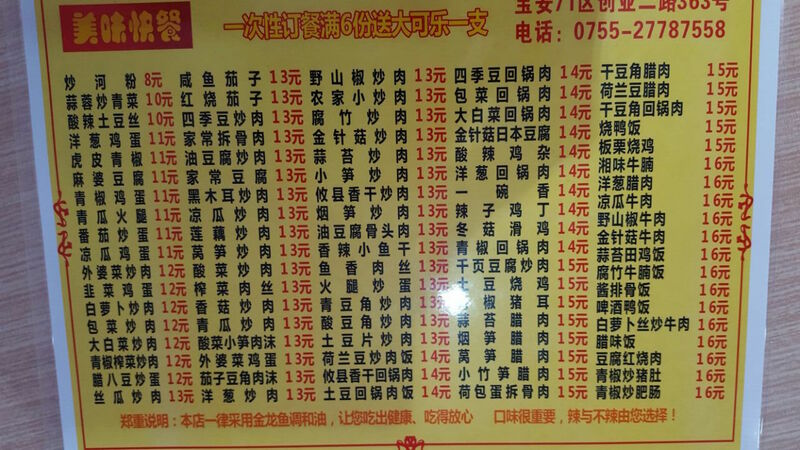 Let me just show you a picture of the menu of the restaurant where we ate today. As you can imagine, we didn’t understand anything, so we picked something random and luckily most of the dishes were quite good (although I couldn’t recognize what meat I ate…)! In the afternoon we, the whole team, met a Seeed Studio to keep on working. JB worked the whole afternoon on the design of our future deposit boxes (they are really starting to look good!). Alexis worked and finished the mechanical design so we’re going to be able to send the files to the 3D printer!!! (although our first trials or printings were a real disaster I must say, let’s hope that we’ll have more luck in the future!). 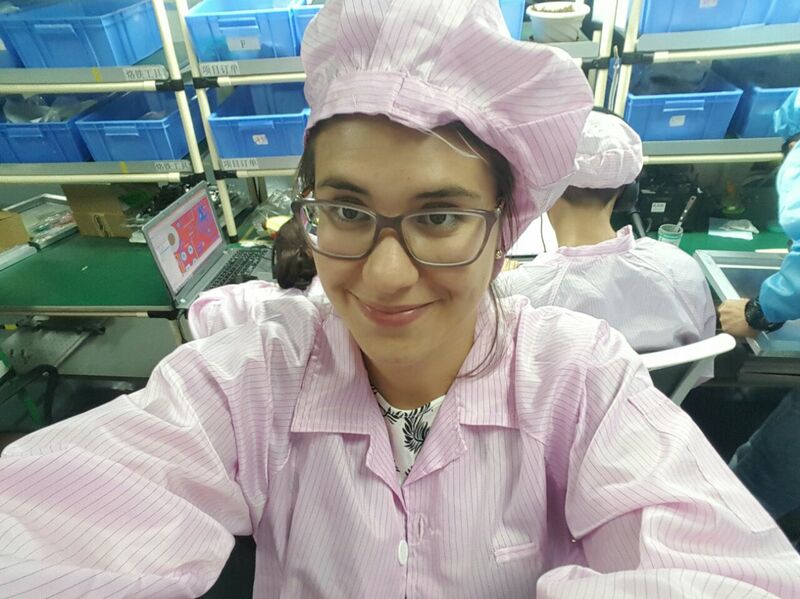 Lara almost finished our website and Link and I helped Sorina making the PCBs. I learned so many things today! 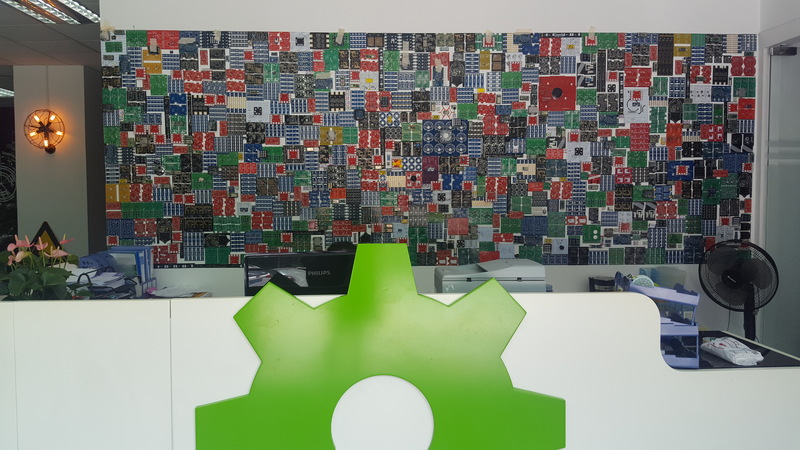 I became the master of the PCBs and actually am pretty proud to say that we even helped all (almost) of the other teams in the making process of the PCBs. So first of all we put the solder paste on our “frame” in order to fix the components on the PCB (that takes way more time that it sounds) and then, we cooked them by putting them in a very big and long oven and then tadaaaaaaa our beautiful PCBs came out with all the components fixed on them! That was actually a great satisfaction (it took all afternoon to get there)! And in the evening, after a kinda failed Uber trip back to our neighborhood we went to the restaurant to celebrate Lara’s birthday and finally got back to the hotel! I’m excited to see what we’re going to achieve tomorrow as well! Stay tuned! Let’s start with Hong-Kong. We were at the Hong Kong University of Science and Technology and you can see on the picture the view that we had from the main building! Pretty nice! I’ll have to take some shortcuts here to explain you what we’ve been doing because otherwise you will never finish to read this article! 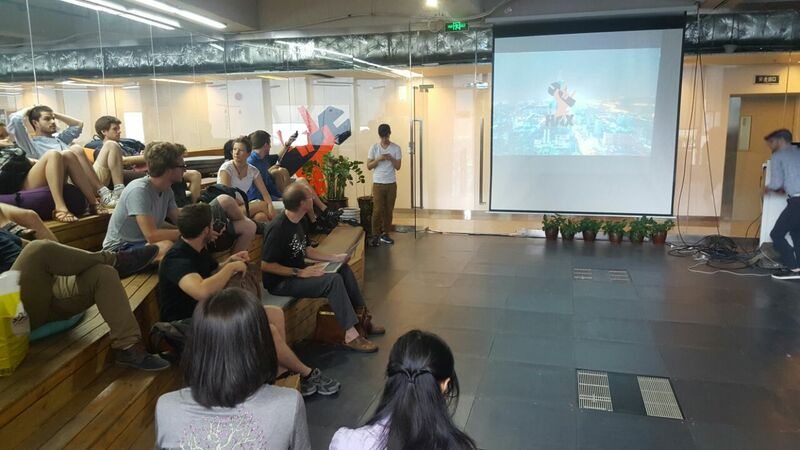 So the main thing that we did in HK was to PITCH, again and again! 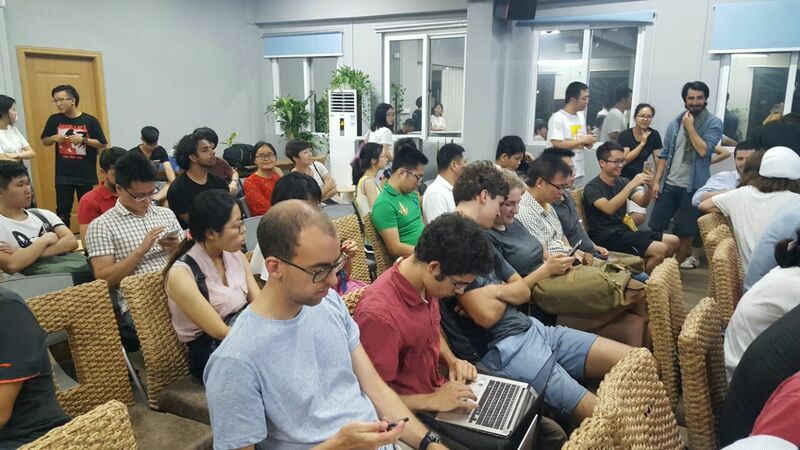 We have all been able to practice our pitching skills in front of different audiences: we met some young and dynamic start-up incubators at Brinc.io, some students at the university, some experimented investors at the Hong Kong Science and Technology Park, some accelerators at Makerhive, etc. So we got some really interesting feedbacks that helped us improve every time! So very challenging but very demanding as well (we went to bed at 4am on Thursday night to get ready for the pitch that we had on Friday morning)! On the picture, you can see how full of energy we were for the first pitch! 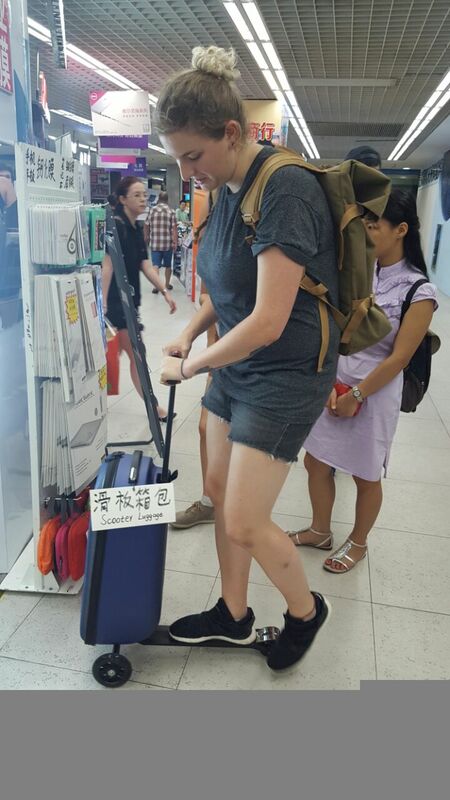 I’m not going to post one showing our faces when we left HK on Sunday…! We did other thing as well in HK but I’ll let you go and check the main page of CHIC on which there are detailed articles about every day that we spend in HK! 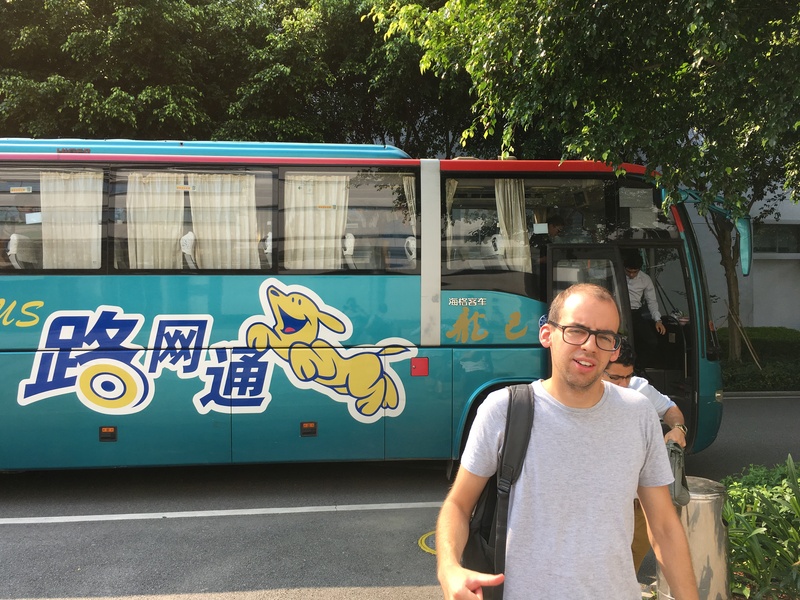 So we arrived in Shenzhen yesterday afternoon. We are in a very nice hotel, which is kind of different from the university dorms that we had in HK. So we are all very happy! 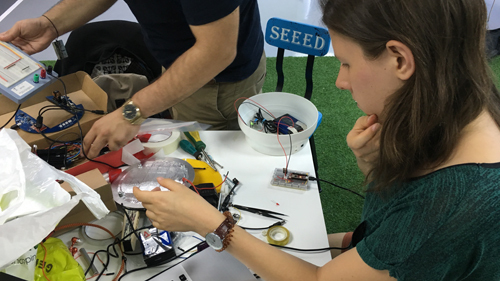 And today, Monday, after a perfect breakfast at the hotel, we started to work on our devices at Seeed Studio. 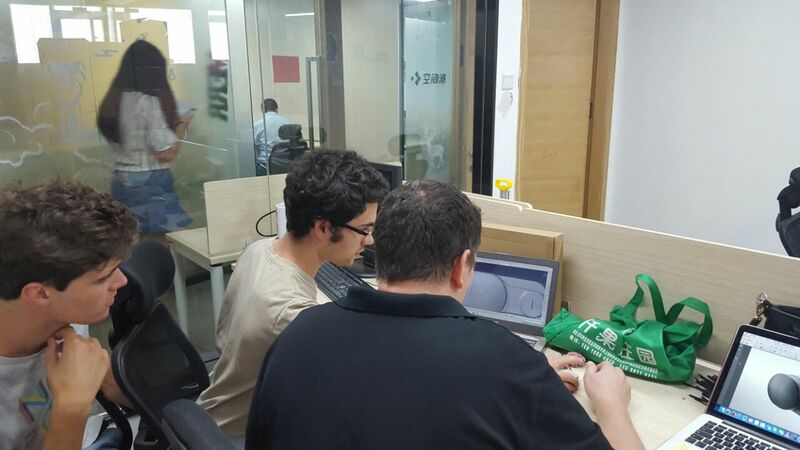 They are welcoming us in their offices so that we can try to build our functional prototype by the end of the week! So it is going to be a very busy week for us. Today we mainly did a list of all the things that each of us need to do in order to have something by the end of the week! JB worked on the design of our potential future deposit box and I worked on the article mainly today, kept my log book up to date so that I don’t forget to share any important information with you and I prepared my program for the week as well. 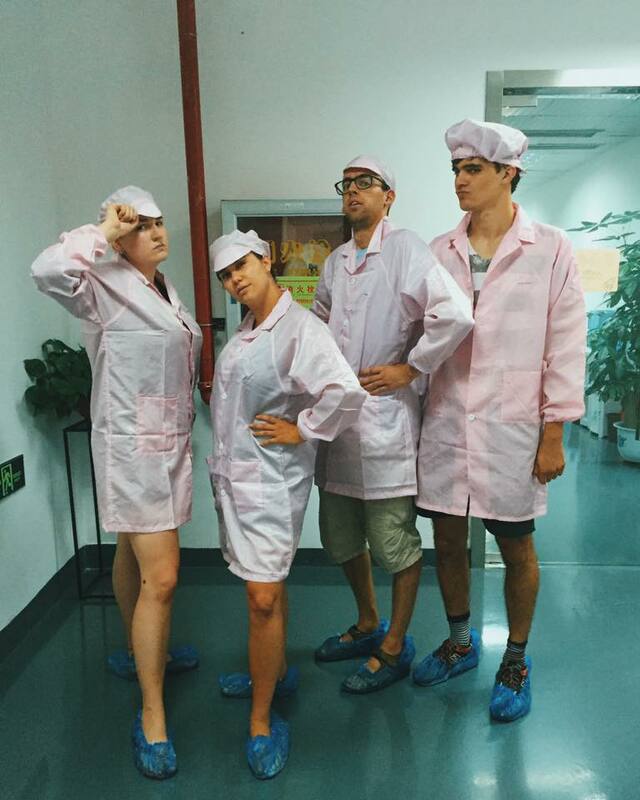 And that’s us… well… visiting the labs with class! 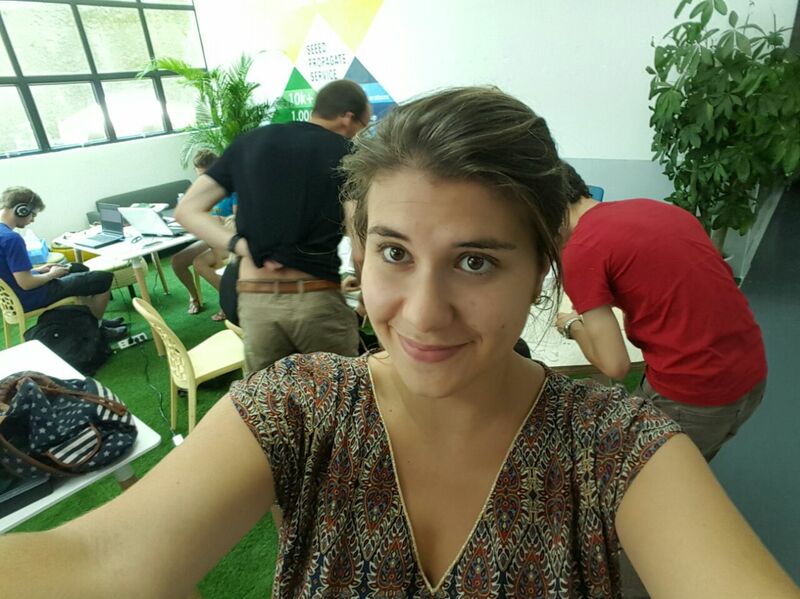 During this sprint I implemented the design made by Lara Defayes, the media and interaction designer of the team. As you can see the UI design has rather well evolved. I added some animations to render the interface more friendly and fun at the image of Aimo. The buttons and some informations of the main menu appear in an animated way once the view is loaded. When the app is waiting for the user to do an action related to Aimo device, the text giving the instructions is pulsing until the action is performed. Filling a form is often a painful task in the experience of the user. 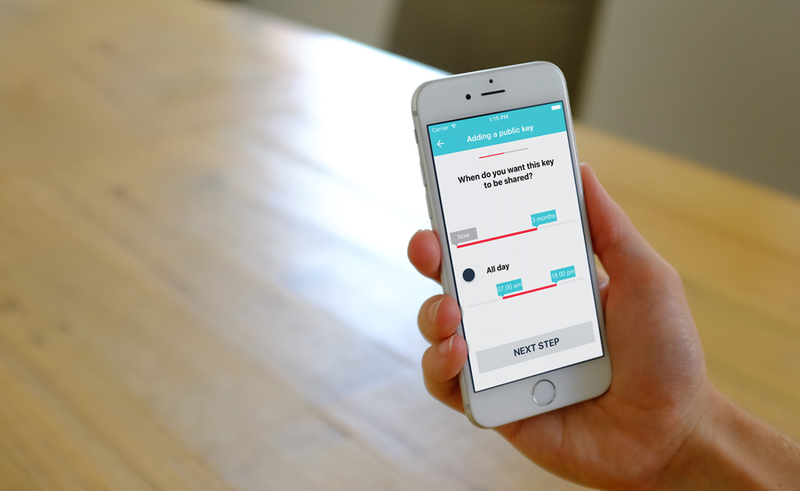 In order to attenuate this step we postponed it as much as we can in the flow of the app. Once the user fills his information, the form won’t appear again. Some animation were also added when the fields are displayed in order to surprise and encourage the user to fill it. 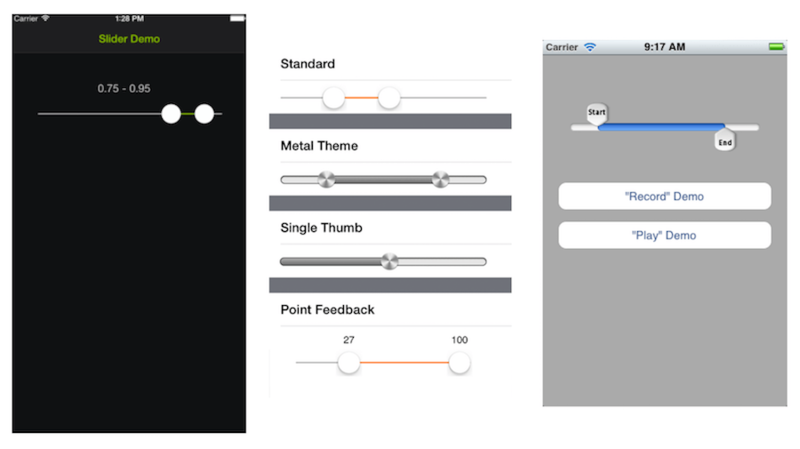 A large piece of the implementation of the UI was devoted to the making of a range slider. A range slider is a slider with two markers in order to set an interval between two values. This UI component is not part of the items offered by Apple with the development tools. Some external libraries exist but their solutions aren’t enough flexible in term of visual customisation. This is the reason why I chose to create one from scratch to better match to our visual identity. A special care has been taken in order to keep visible the value of the marker even when the user’s finger is on it. To avoid the finger obstruction the marker is automatically shifted up in order to avoid being hidden. 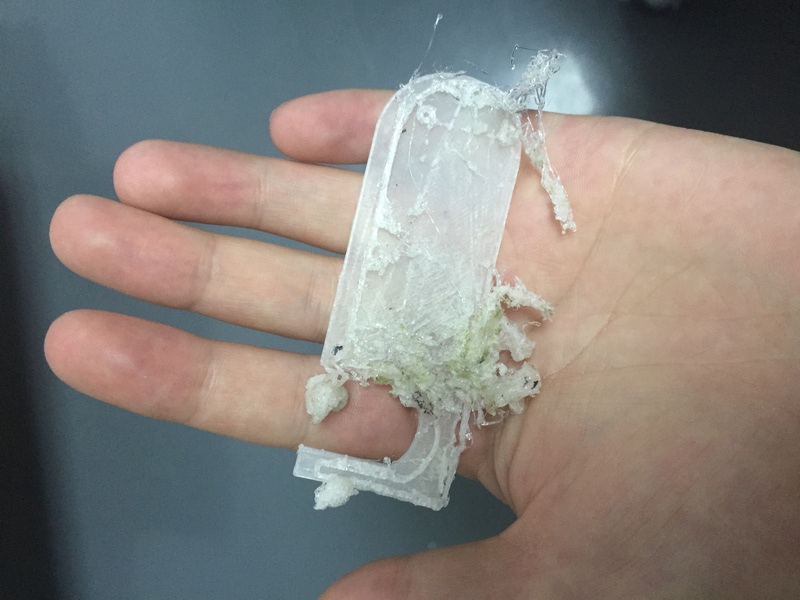 Because of the finger obstruction some user tends to move their finger down after having tapped an item to better see and control what is happening. If that happen, the marker drops down to its initial position on the bar. Drumroll…. 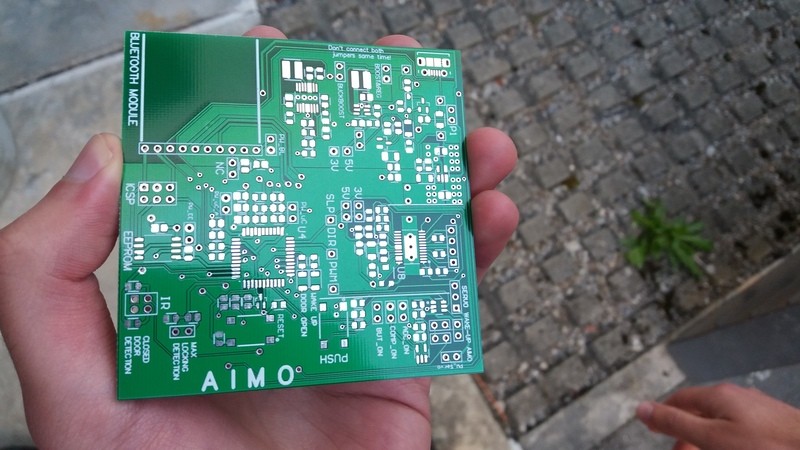 Our Aimo connected device starts to take shape in terms of electronics as well. 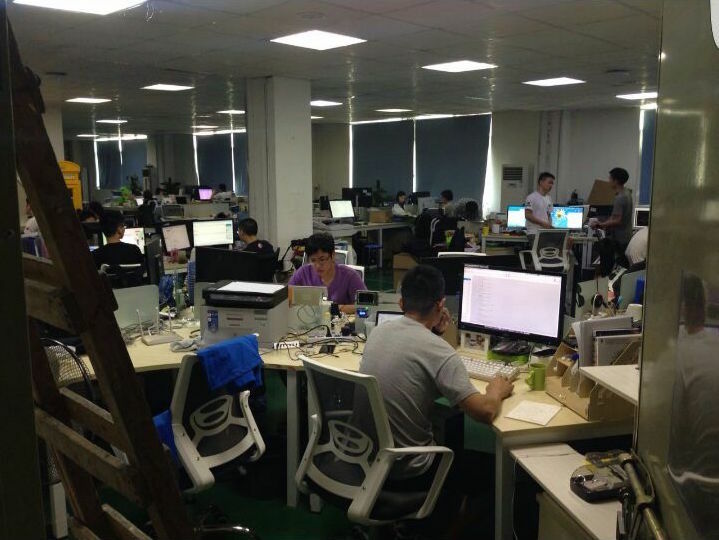 We designed the first testing board using Altium Designer and we sent it to fabrication at Seeedstudio in China. We received it last week and we got very excited about the quality. 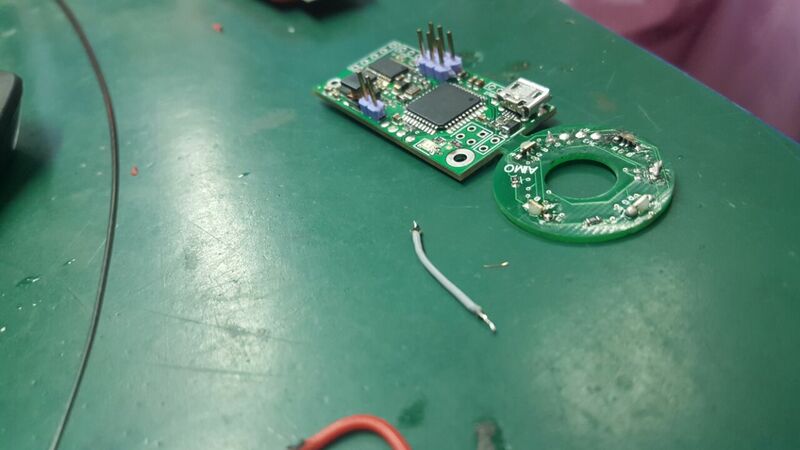 Next week, we plan to solder all the components on it and test our firmware that was written for the prototype version. During the interviews performed by Sara, we received many requests to track the letters inside the mailbox and annouce them if there is mail inside. 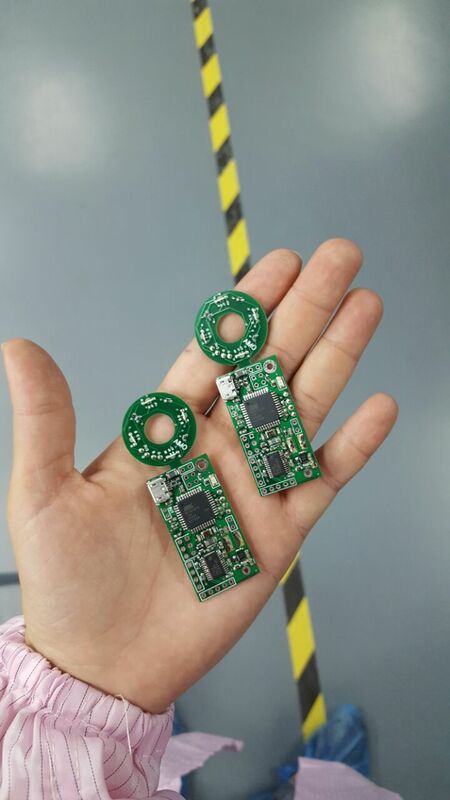 However, we already anticipated this requirement, such as our PCB contains a phototransistor-LED system that has double role: check if the door is closed and count the number of letters. Last but not least, we did some more detailed calculations on our power budget, and guess what? With the feature to keep the MCU in power down mode (consuming about 500 nA), we are able to power Aimo using a LiPo (7.2Wh) for 1 and a half year!! This is really amazing, because our users shall not stress about charging Aimo anymore. 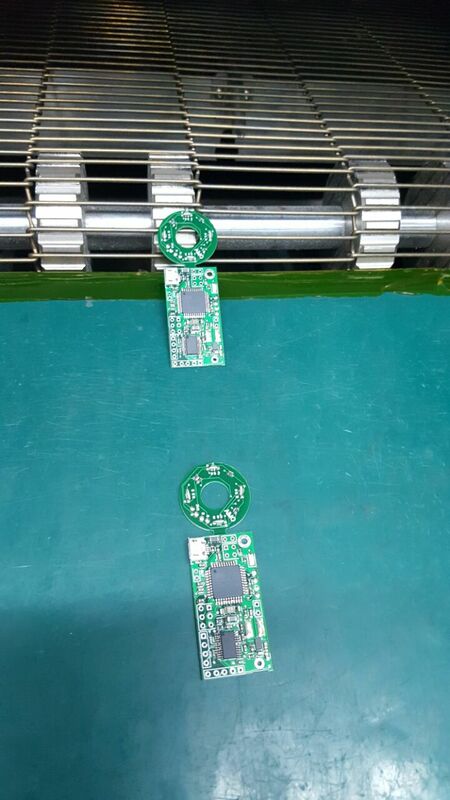 We will keep you posted as soon as we solder and test our PCB!!! Time is passing by so fast! Only one milestone left before we go to China! Let’s look at what has been done on the business side during the last month. I focused on the competitor analysis and therefore the positioning of Aimo on the market and have also run the second round of face-to-face interviews with potential customers. On the competitors’ side, we need to consider several categories of products. 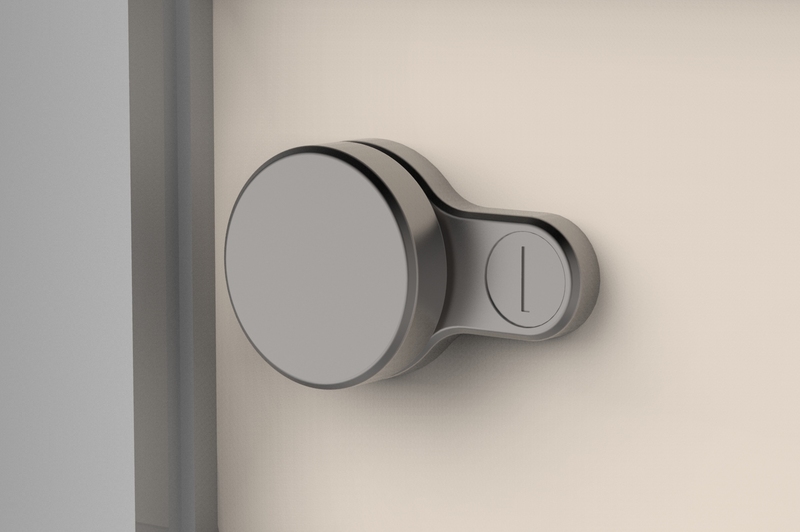 First of all, we have the smart locks, that are destined for apartments or house doors. In this category, we find several competitors. Then, we have the complete connected mailbox. There are less competitors in this category. These are either oriented towards the tracking of the mail or common/public mailboxes. We also have the mailboxes’ smart accessories that aim mainly to monitor your mail. So it is more about knowing when you got mail or when someone opens your mailbox. And finally, we have connected padlocks, that are used as traditional padlocks but with remote control through the smartphone. With Aimo, we aim to differentiate ourselves by first of all lowering our costs and therefore our price considerably in comparison to the existing smart locks on the market. We also will differentiate ourselves on the brand image side. 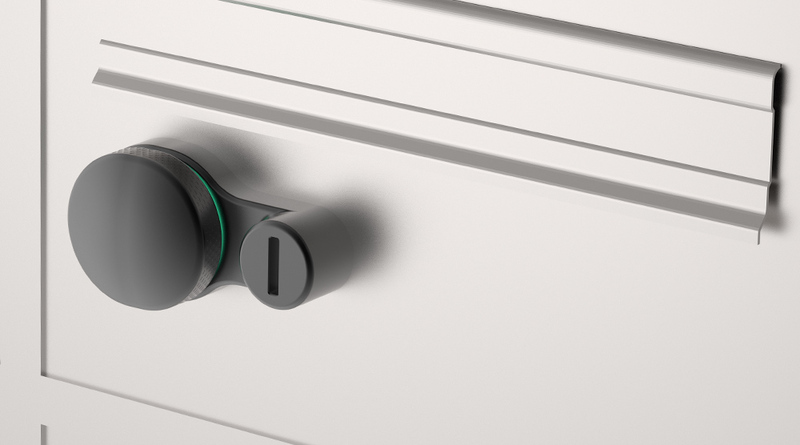 The house door locks need to have a serious look since they need to inspire strict confidence, but with our connected lock being implemented on mailboxes, we can add a friendly/fun side, and still be trustworthy and serious. You can have a look of the schema below representing our competition landscape. 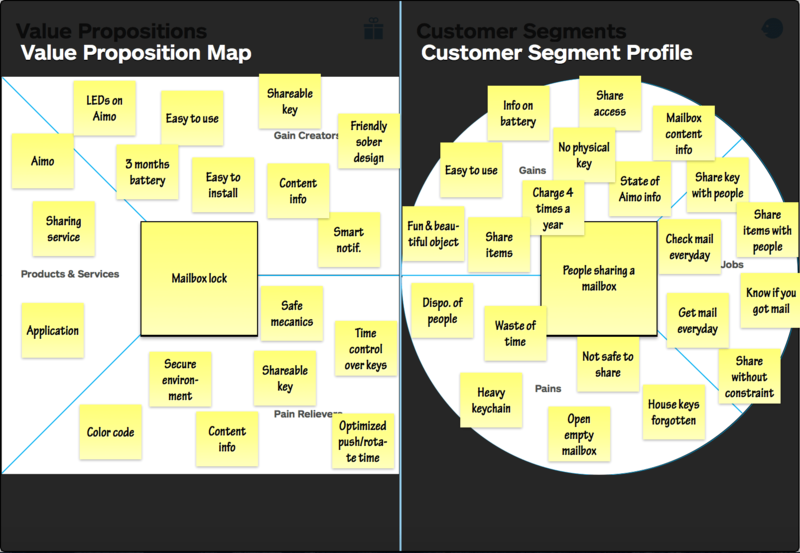 Regarding the interviews, as you can see on the picture above, I am always upgrading my value proposition canvas. 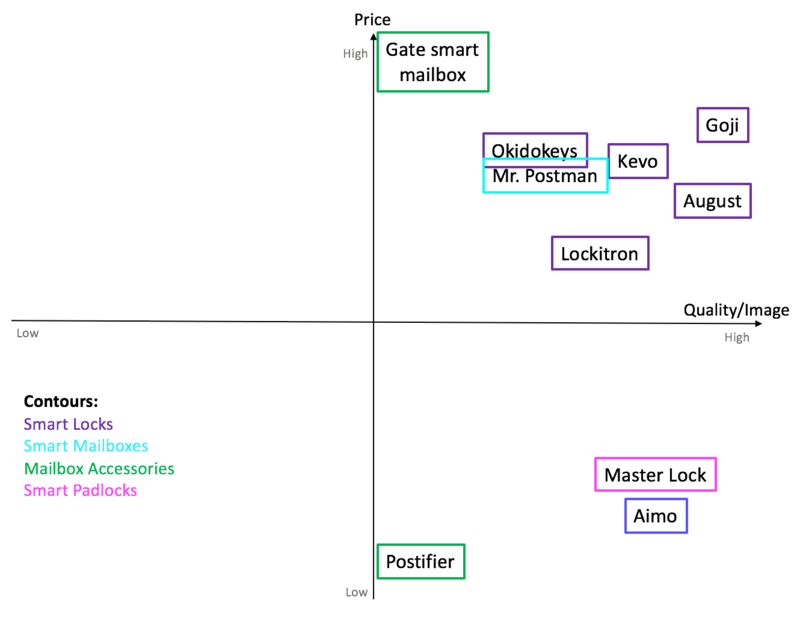 Anyway, we found out that most people want to buy Aimo because of the key sharing feature and therefore the ability to use the mailbox as a locker. They like the fact that they can share goods without constraints, in a controlled manner and also with safety. They like that the mailbox is still their own, so it doesn’t become a common box or public good but they can share when they want and to who they want. This awesome adventure is the opportunity for me to update my mobile app skills. 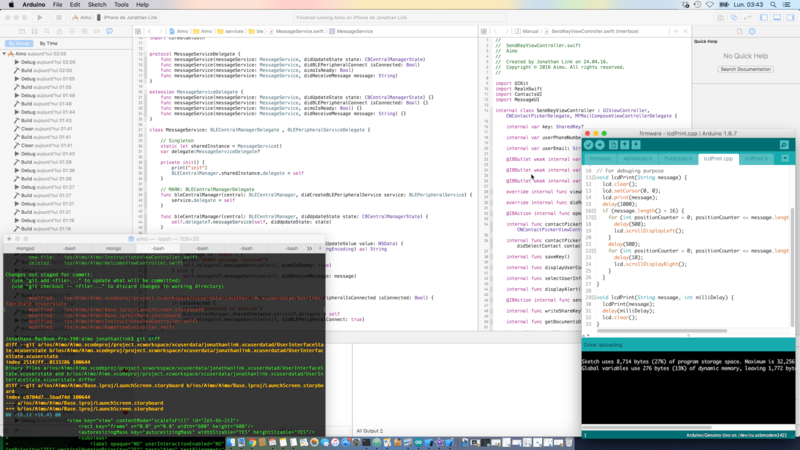 A lot of new things have appeared and among them: Swift. The brand new language from Apple especially designed in the aim of replacing Objective-C. 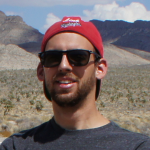 Swift brings a cleaner syntax but above all a functional paradigm. It took me some times to adopt it but now I feel more and more at ease with it. Before coding anything, I wrote a specification document describing each views and features of the app. That helped me to split the application into several smaller parts. Each of them has been or will be coded in a sprint. Also, I defined what kinds of messages will be exchanged between the mobile app and Aimo. The protocol I chose for communication is Bluetooth Low Energy (BLE). We didn’t really have the choice but anyway this is the best one. The wifi would have quickly drained the battery of the smartphone as well as Aimo’s one. On the other hand, the NFC could have been an interesting option but is not opened to developer on iOS and its range of a few centimeters only wasn’t enough for our needs. I am also writing some pieces of the firmware of Aimo. Especially the communication part and its internal database. This side of the project is also very interesting for me. This is an excellent way to dust off my knowledge in C language and it is still challenging to write code for devices with memory constraints. Source files of the iOS app and the firmware are versioned using git. Here comes the time to design the communication around Aimo. But before we begin, why Aimo? What does this name even mean? Our name comes from a french saint called Aimo of Satigny who was known for his charitable kindness. As our mailbox offers a new way to share your goods with the people you love or the people around you, we found this was a sweet wink additionally to the nice and fleek way the word visually looks and phonetically sounds. The first step for me was to find a Typeface that would fit our needs and vision. Aimo is an connected object that needs to be seen without taking too much attention. That’s how I pictured the font, discrete with a twist. 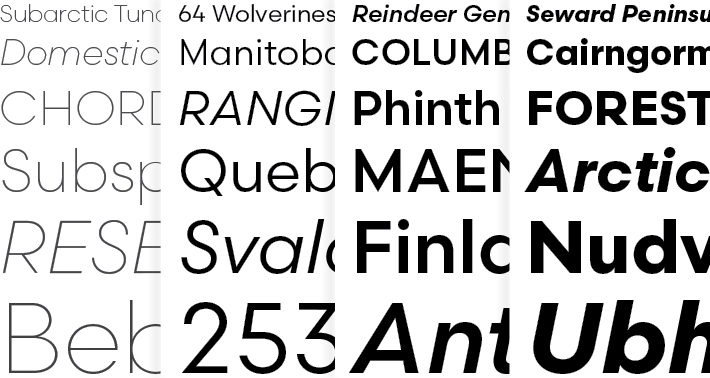 The typeface I chose is the Scandia Font by the Process Typefoundry. This is a geometric sans serif font with some lush curves at the angles. Elaborate but sober as Aimo will be! The Aimo logo follows the same reflexion. With the I tilted to the A, it gives the twist I was talking about without being too much or too tinsel. The next step was the UX Design, if you want to have a look at our design inspirations you can follow this link. Until now I was designing apps and websites on Photoshop or Sketch and using Marvel to make interactive prototype. For the first time I am using the new app of the Adobe Creative Suite called User Experience. This software at last merges the two main aspects missing in other apps: being able to design and link directely inside the app the different templates to make a working and interactive prototype! 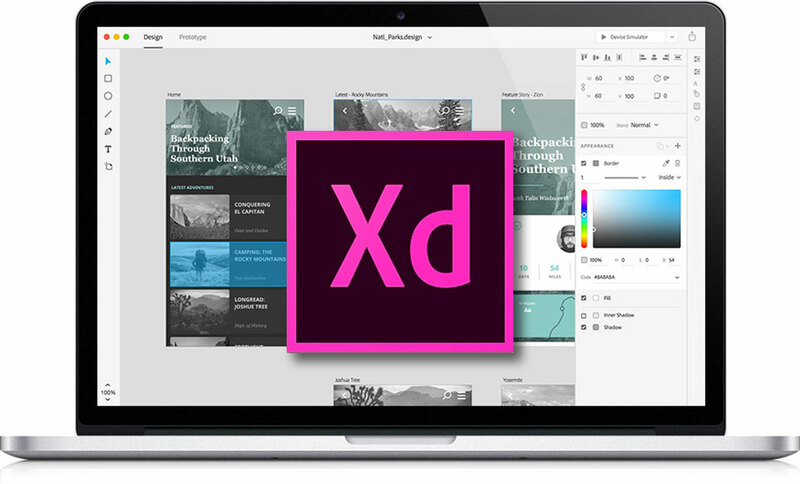 For now I am very pleased with this new tool and I look forward to seeing how we the ux / web design world will evolve with this kind of software! After this long period of silence, I’m glad to announce you that the new version of Aimo is ready and the 3D printing is on-going ! The previous one helped us a lot to realize our mistakes and then improve our design. On the agenda, nothing less than the reduction of the size of Aimo, a new knob along with a more stylish design, and a working mechanism. 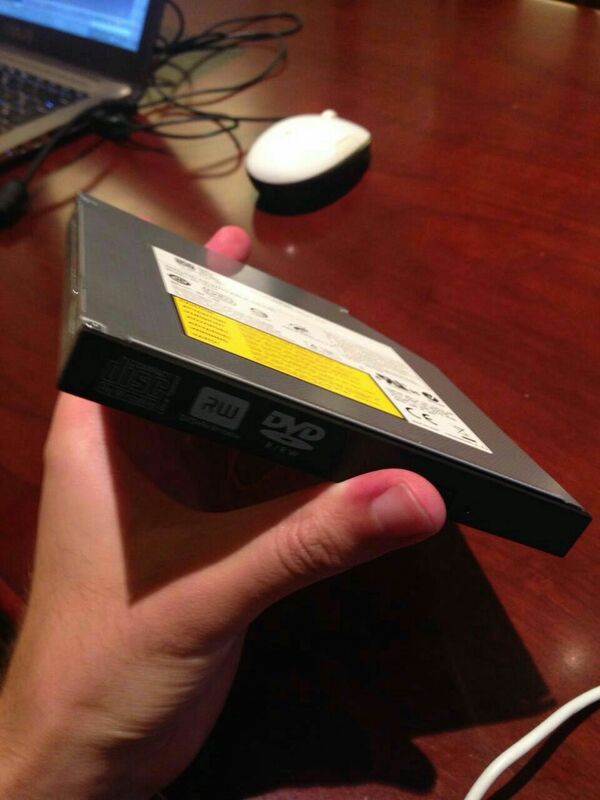 Of course, this is not the final design. Make something good is a long path, and you can reach this goal only by successive improvements. 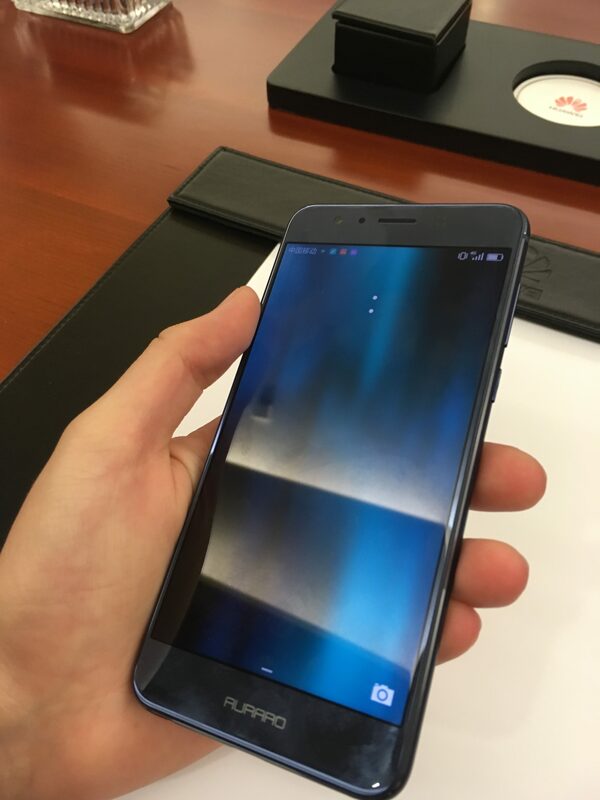 For the material, we are thinking about steel (manufactured by Metal Injection Molding), so that we can make a really robust and handsome device. Perhaps we’ll add some hidden parts in ABS in order to lower the cost, reduce the weight and increase the scope of the shapes. And please, if you like us or our project, subscribe to our newsletter! We hope everyone had a great Easter! We are happy to have survived the first milestone! 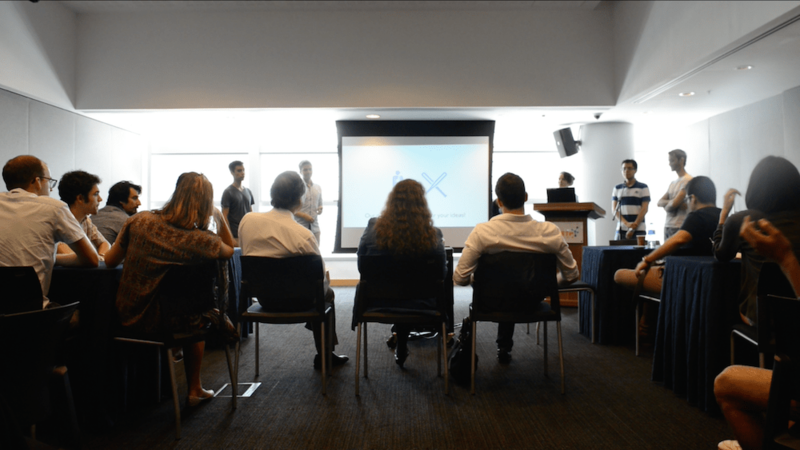 For this step, which took place last Friday, we basically needed to present in front of the “jury” (the professors from the different universities) all the progresses that we’ve made during the last month. We were proud to show our hard work! On the business side, we’ve decided for now to focus on the inhabitants of all kind as customers as they are the on with who we tested our hypotheses and we got a positive feedback. For the future, we are thinking about testing potential partnerships with universities and post officies to see if they would be interested in Aimo. 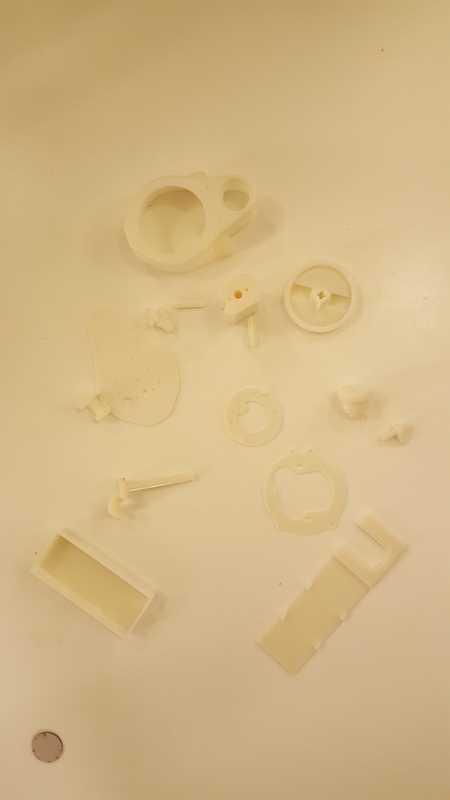 As you read last week, our industrial designer is progressing really well on the design of Aimo but of course there are questions remaining about the materials and the shape of the final objetct! On the engineering side, I’m not a professional so I wouldn’t want to risk saying some mistakes but I think that I’m pretty safe saying that everyone and everthing is progressing really well. 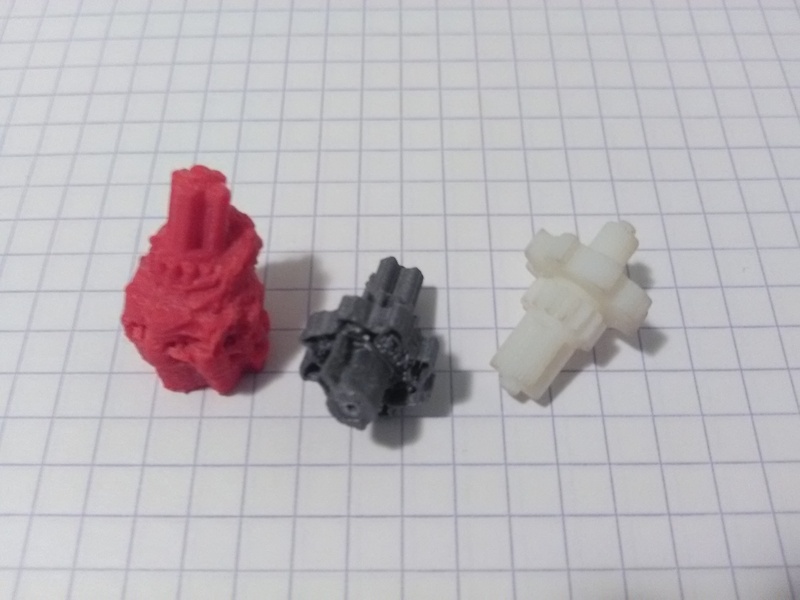 Regarding the mecanics, Alexis has worked a lot and we have 3D printed our components and it’s pretty promising! Regarding the software, Link is coding the app and with Sorina who worked on the electronics, they have been able to show us some working interactions. Getting closer to a prototype, yay! To sum up, we are happy with our progresses and results even if, obviously, we still have a lot of work so stay tuned! If you are interested in subscribing to our newsletter to get more news, click on this link! How do I design a connected mailbox locker? First of all, I need to understand perfectly the aim of the object that I want to design. This is really important! In a second time, I collect different images that can inspire me, I observe the existing lockers to understand how they work. Once that preliminary research is done, I try to see outside the box and look for inspiration that can come from a total other field. At that point I need to test different ways for opening a mailbox (is it something that I turn? That I push? Is it more like a normal handle door? …). I can now make a decision and choose the best way that will perfectly fit for the required function. Now I can choose the best materials and shapes that follow this function. The materials and the shapes need to correspond perfectly to the situation (will the object be outdoor or indoor? Is it an object that will be used often?). Also, I need to integrate the technical issues in my process and try to design an object that will be easy to produce and manufacture. Now I can make the right proportions and put the right curves and the right fillets in order to create a beautiful object in the context of use. I choose a nice finish and a nice coulour in the end. Now you know more about the design process! Not that straight-forward, right? Here are some images of my progresses! 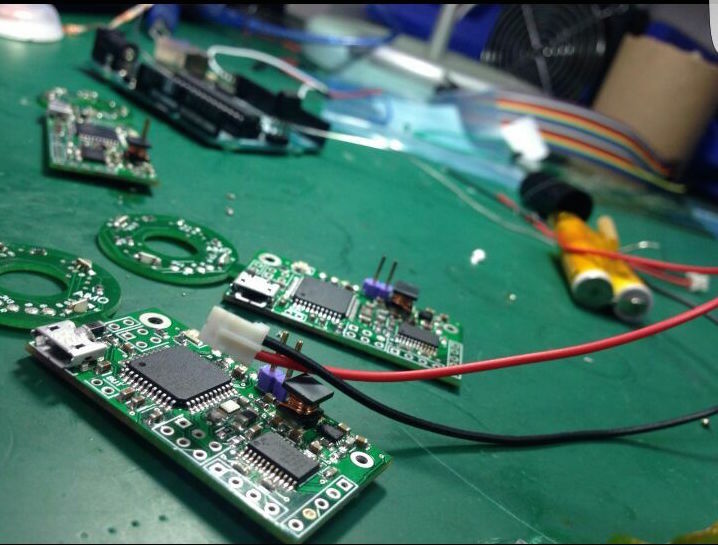 In parallel with mechanics, our engineering team is also working on the development of the firmware and electronics, as we want to have a working prototype by the end of March. 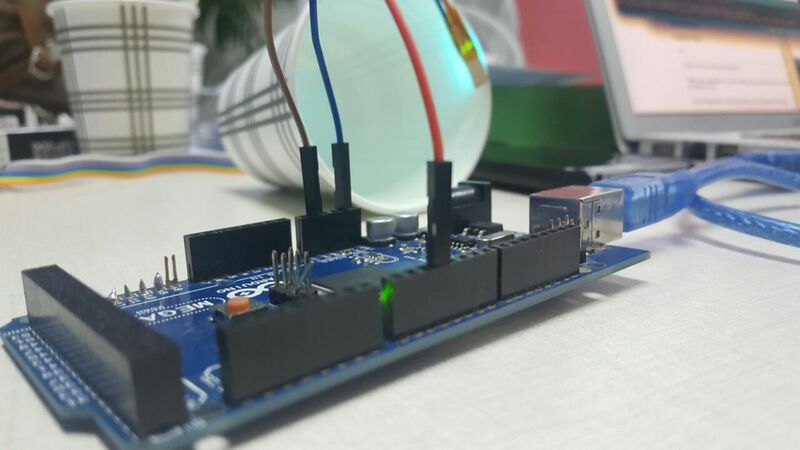 For prototyping, we used an Arduino development board. At the moment, we interfaced a Bluetooth module with the microcontroller using several example codes. 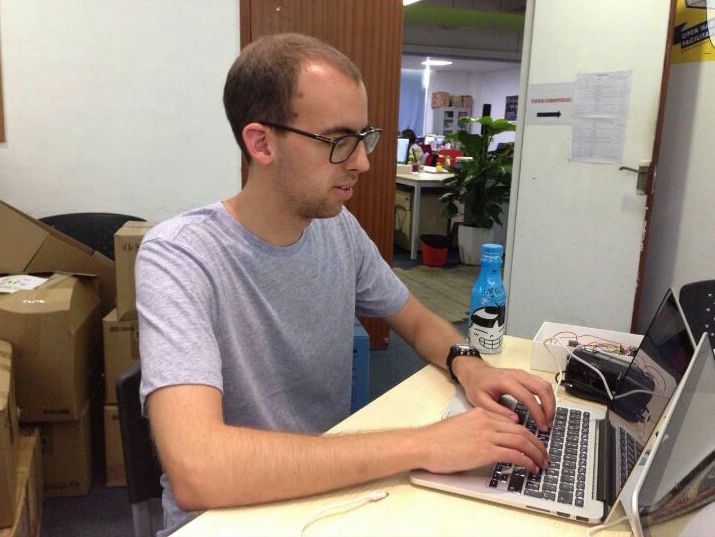 Our software guy, Jonathan (but we call him Link inside the team, just so you know) started writing the iOS application for our product. We wanted to order the Bluetooth module that is provided by Adafruit, but unfortunately the shipping would have cost 6 times the amount of the module. Therefore, we decided to buy it from Romania and bring it here in Lausanne by a bus carrying people between Geneva and Bucharest. The same way, we ordered a mailbox (which cost only 5 CHF) because we thought it would be nice to disassembly it and get an idea of the dimensions/space for our product. As you can see, we are a very inventive team and we find quick solutions to solve our needs. 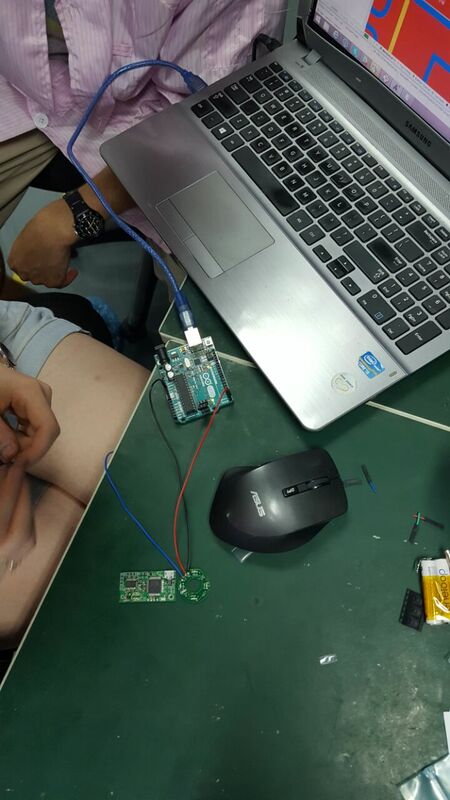 This weekend, we plan to finish the prototyping with the rest of the components we ordered, this time from China (the stepper motor, the sensors for detecting if the door is closed or not and the force sensor for detecting if the button was pushed or not). The next steps would be to start doing the PCB board that will be incorporated with the mechanics. In this direction, we will use Altium Designer, as both Sorina and Alexis are proficient with it. 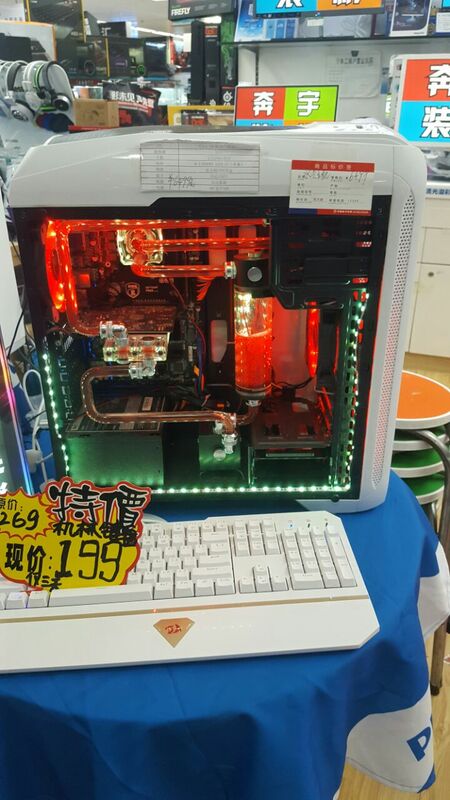 We can’t wait to see AIMO working! Come on and let’s rotate Aimo! But now, it’s time to explain how this strange thing works! Ultimately it is quite simple. There are two parts: one that will be inside the mailbox, and the other one outside the mailbox (yes I know, that’s already complicated, but try to stay focused…!). Inside, you have the battery, which is easily removable, along with some electronics, which allow to identify you (and steal much information about your private life at the same time). Outside, strictly speaking you have the lock. Basically, it is a rotary knob. You just have to press on it to wake up the device, and then rotate it to open the mailbox (obviously if you have been successfully identified…). In addition, there is also a mechanical lock to unlock the mailbox in case you run out of battery on your smartphone or if your perfectly working hardware breaks down. That’s all from the mechanical point of view ! The hardware will soon follow, don’t worry about it and stay tuned! We are really progressing with our device Aimo and this is partly due to our (outstanding) organization, as you were able to see it in the last post. In addition to using several different applications, we also are clear on each member’s responsibilities and roles, which is very important. 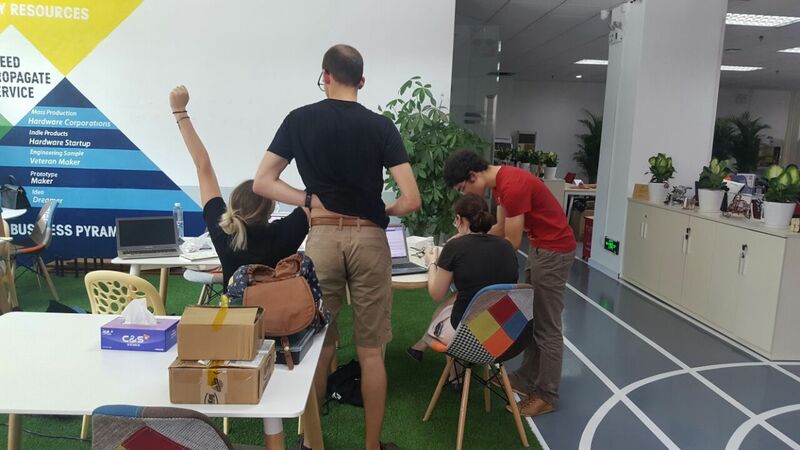 But the good thing in our team is that even though we have well-defined tasks, we are always available and ready to help each other in any activity. In this post, I’m going to talk about my specific tasks and role in this project. So I’m the business person in our team, that means that my tasks are mainly related to business models and value propositions, as well as the relationship with the customers and the market. So when the engineers or designers have a crazy (but good, obviously) idea that in the end will not be viable, it is my job to bring them back to the ruthless truth of our world of consumption. The nice thing about a new project is that you can still make all sorts of ridiculous assumptions before you realize that those will not happen. But it is good and necessary to broaden your mind at the beginning because sometimes some of the ridiculous ideas aren’t actually so bad. You need to think about who your customers are going to be. 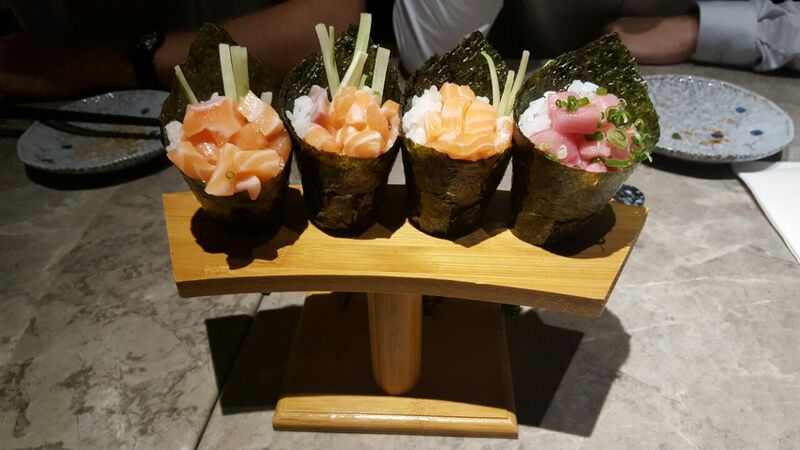 Are there different segments? And inside of each segment, can you observe other divisions? Once you’ve figured that out you need to ask yourself: so what will I bring to those customers? What kind of problem will I solve for them with my product? How can I make it to be actually useful to the customer? So that’s what I’ve been doing lately. And to answer those kind of questions, what’s better than actually going outside and talk to the potential customers to verify all the hypotheses that you’ve previously made? Nothing. So that’s what I’m doing too right now. Try to interview as many customers as possible in order to make the best product and also being able to sell it afterwards (obviously). I’ve been able to observe a few trends already and I’ll keep you post-it for the final results! We would be grateful for your help! 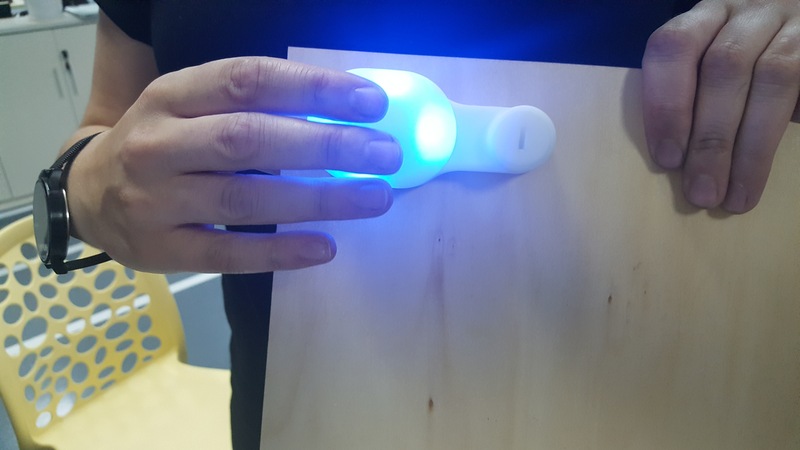 The spirit of CHIC is not only about designing an innovative connected device, but also rushing to be able to do it right in a very short period of 6 weeks. We are very excited by the challenge and we have set up an efficient organization to match our demanding mission : Bring Aimo to life ! And as you will see, that’s a lot of different tools ! The backbone is Slack. This tool allows us to discuss, exchange ideas, share documents, plan our meetings (at the bar), or even conspiring against its partners ! Hence, we can stay focused, motivated, and consolidate a friendship. As you can see we are very talkative, with approximately 1500 messages a week ! Now, Dropbox, Google Drive, and Paper come in to complete the whole picture. They help use manage our resources, collaborate, and share our progress with our mentors. And last but not least, to be connected with the real world, we have our own blog, have a look ! Soon, an update on the progress of the project ! We have been selected to go to China and we are extra motivated! 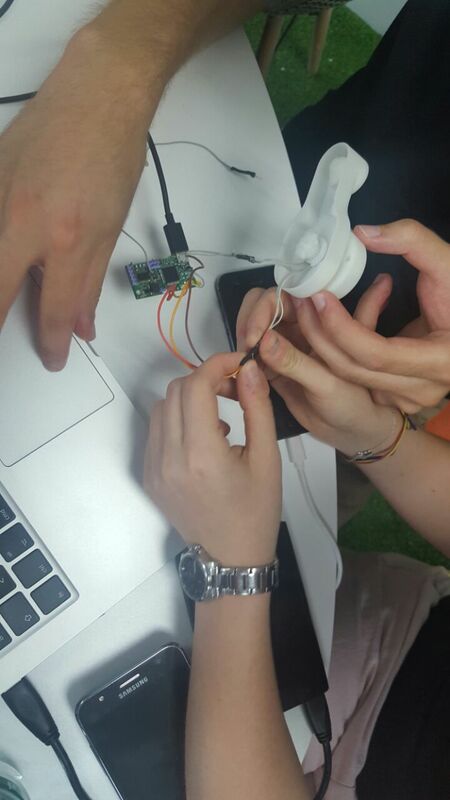 We had to change our connected object Aimo a little bit because our mentors helped us realize that we had some issues with our initial project. But it’s a good thing that we found that out at the beginning and not later, indeed as the architect Frank Gehry says: « don’t fall in love with your first idea », because it will be harder to change it afterwards. 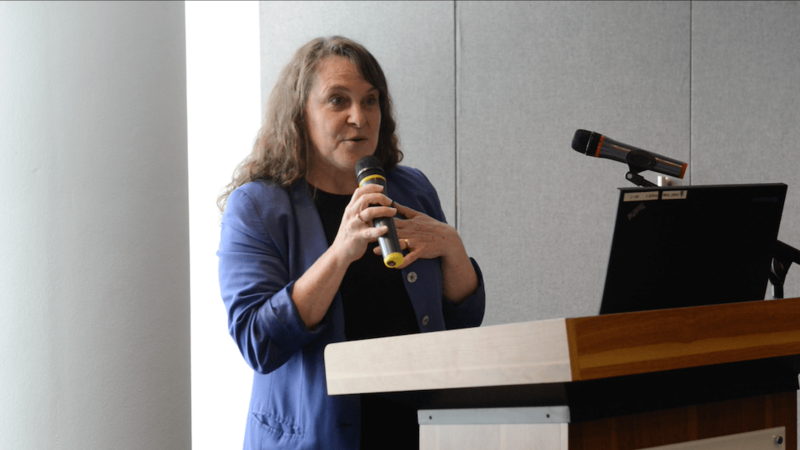 Our focus was on improving communication between neighbors and the life in neighborhoods. We brainstormed together to broaden our set of ideas. 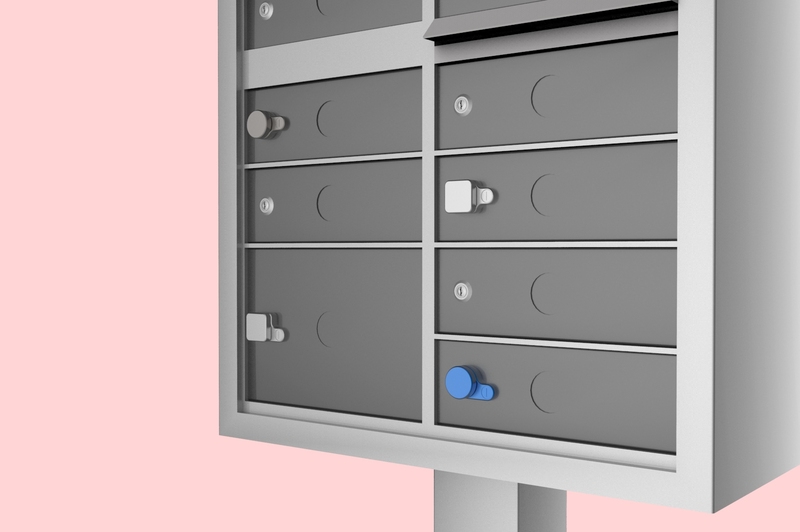 And at the kick-off weekend (February 20th), we finally found one idea to focus on: A connected mailbox locker that allows people to open their mailbox door with their smartphone. The locker will be coupled with a screen that displays the name of the mailbox’s owner or any other notification. 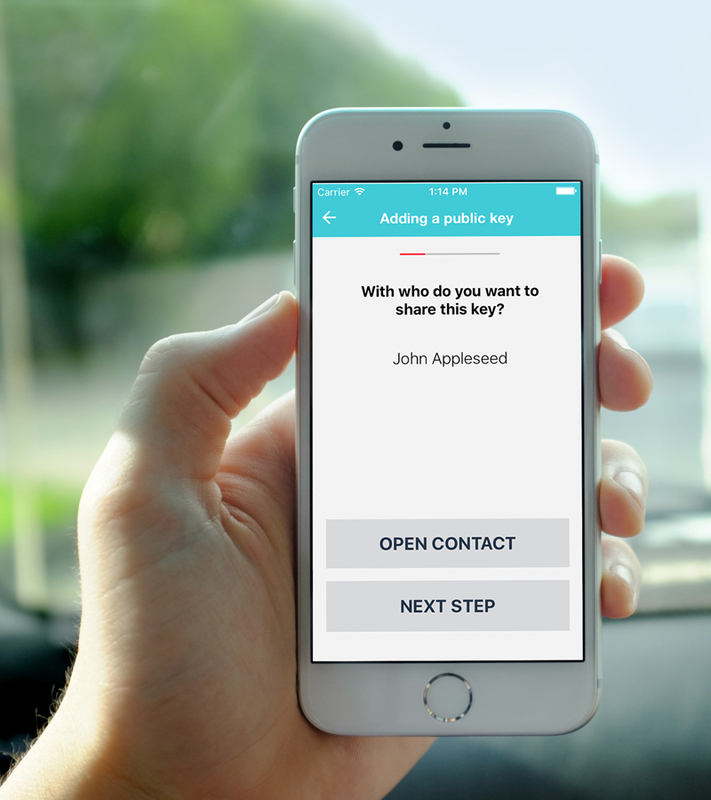 The smartphone will replace the mailbox key. Also, they will be able to share their virtual key with other people in case of need, there will be obviously an expiration time in this case for safety purposes. In this manner, people will be able to use their mailbox as a deposit box where neighbors can share good with them. In this way, we keep our main idea of sharing things with your neighbors and friends and at the same time we create something useful for the users of Aimo. We are going to weekly post on this page our progresses and we can’t wait to get started with the real deal now! We believe in our project and you can see at the bottom of the page that we have the right team to successfully carry out this project.